Miss Joyce Herrmann (catch her on IG) should be a guest host for this CAL, hehe! 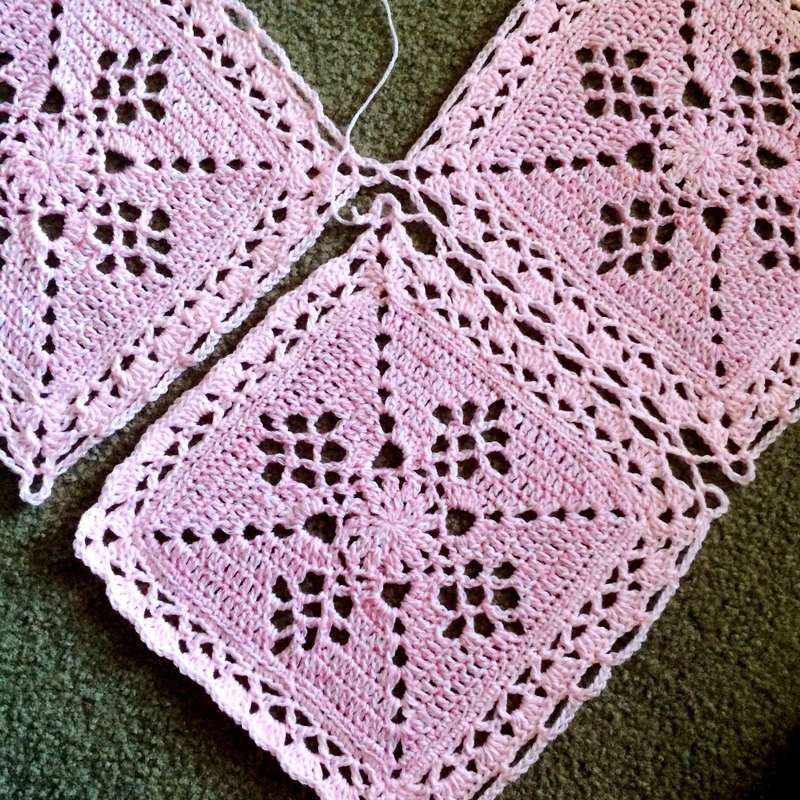 Once the Victorian Lattice Square really took off, Joyce was there, ready to dedicate an entire month to the pattern. During her exploration, she mixed in a lot of her own design elements and color theories, and I can truly say, Miss Joyce is an artist! 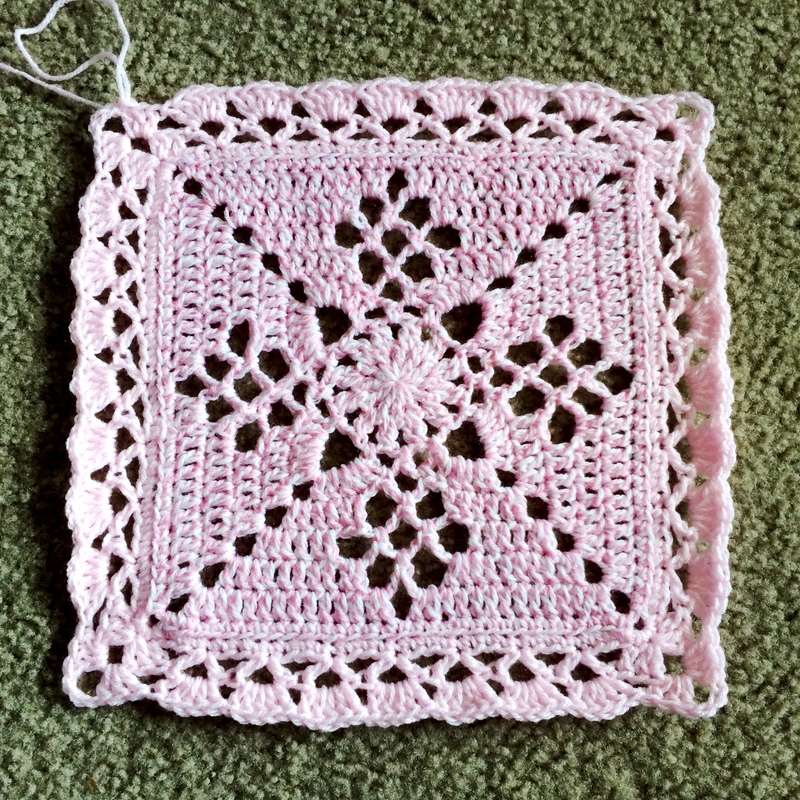 She even wrote up the chart that is now included in the Victorian Lattice Square pattern – a thousand thank yous! Then, look at this beauty! 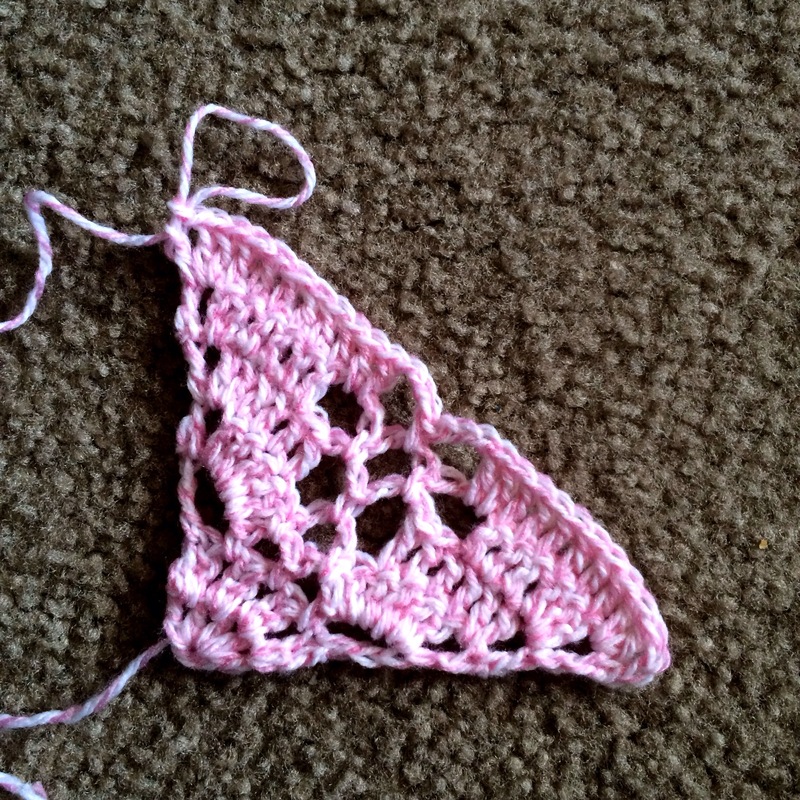 And what a gem, she wrote up a chart for the lace edging – seen below. Now, we’re getting creative! Things are heating up! 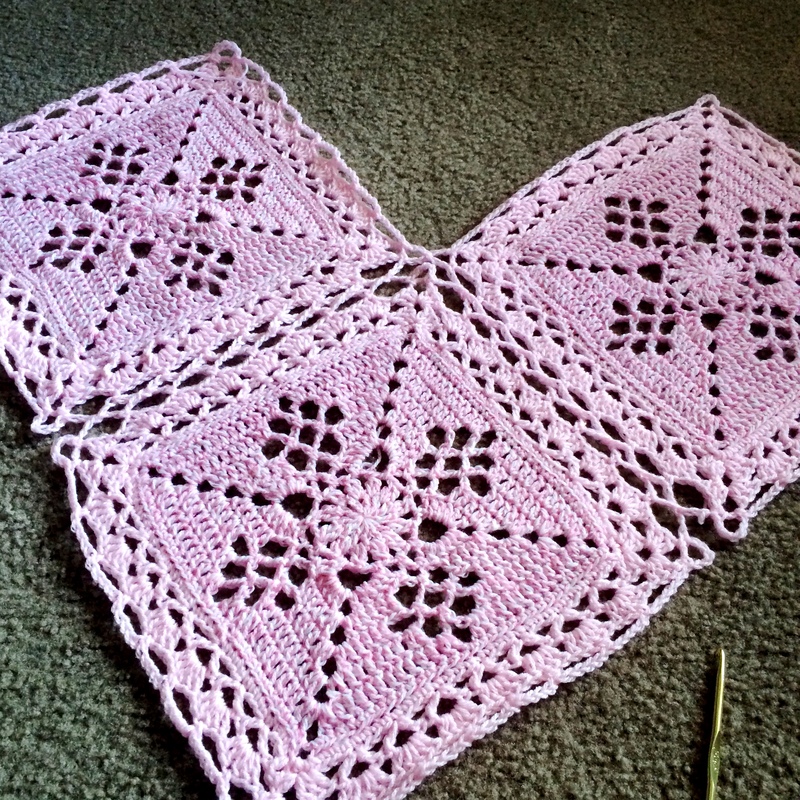 One of my favorites is featured as a main photo on the Ravelry page for this pattern, and with good reason. Wow is this ever pretty. I am in awe of how the contrast back panel peeks through the lace eyelets – genius! Talk about perfect for the holidays. Reminds me of Frozen! How the mood can change just by flipping the switch on the color choice. 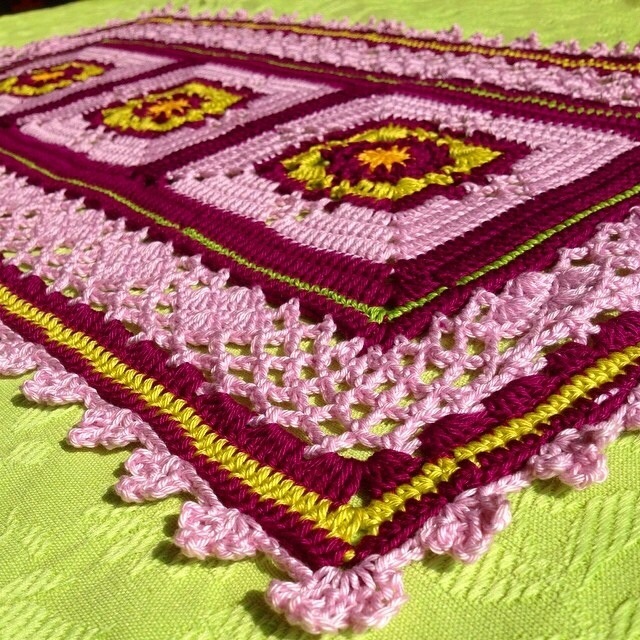 This is also when I knew Miss Joyce was committed to exploring every possible color combination that she wanted to dream up – it’s just that addictive of a design! Just wow! What a bright and joyous piece that would brighten any space. The piece de resistance – an Autumn mix of lush muted tones are just perfection. 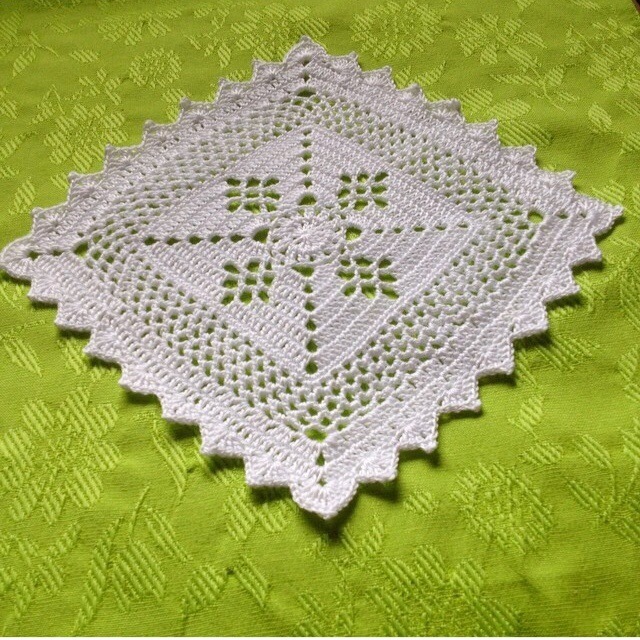 I fell in love with this when Joyce used the Celtic Lace Join. It just really suits the pattern very well. I’m craving pumpkin pie after seeing these colors! And how warm is this vibe? Fall palette plus a revival of the traditional white lace crochet equals total comfort. Thank you Miss Joyce! 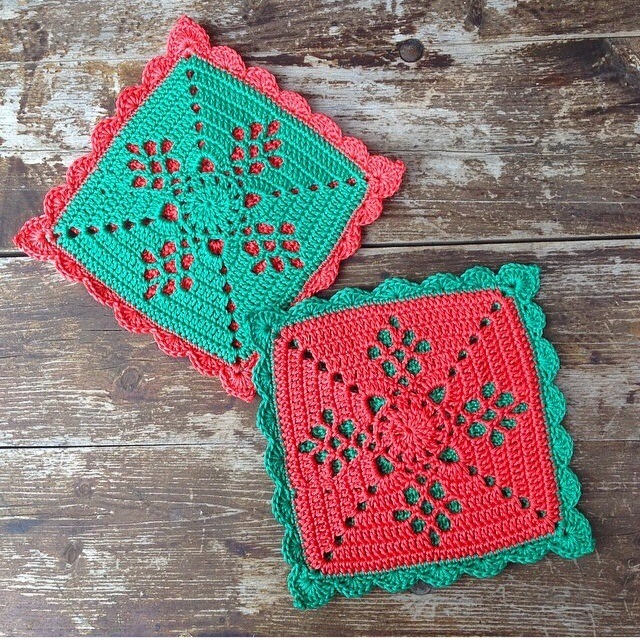 For letting me feature you on our little site, and for dedicating a month to this glorious pattern – perfection! 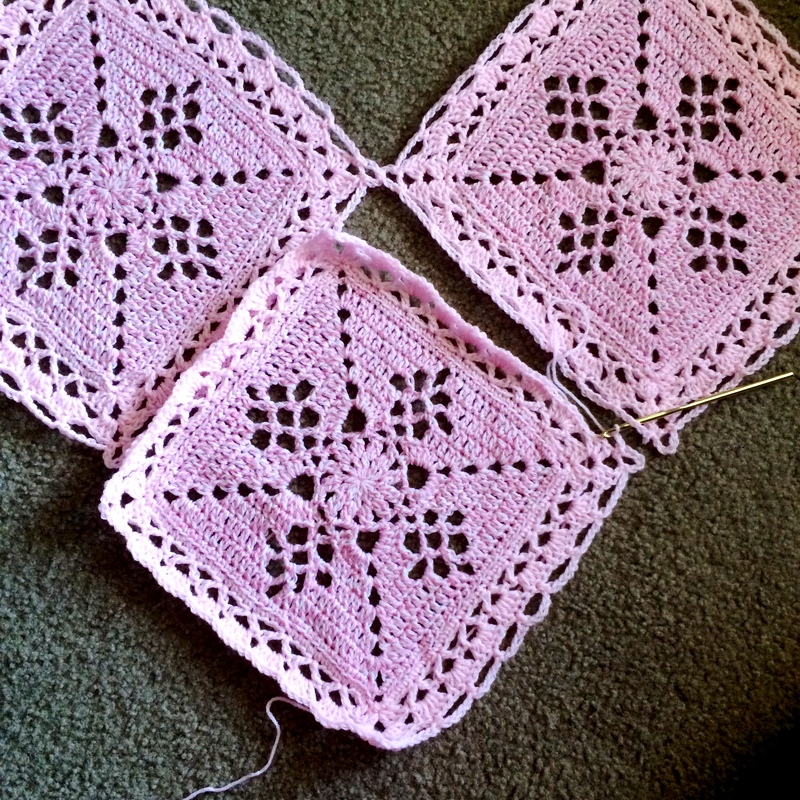 Take a look at these fantastic stacks of lush Victorian Lattice Squares and partial squares. I am so proud of everyone who is working along with us! This square is utterly captivating and seeing everyone’s interpretation of the design is what truly makes this project come to life for me. Go on and browse through the #MysterySquare2014 tag (now over 300 posts!) and you’ll see there is so much more than what is simply featured in this post. Just precious work – pure happiness! 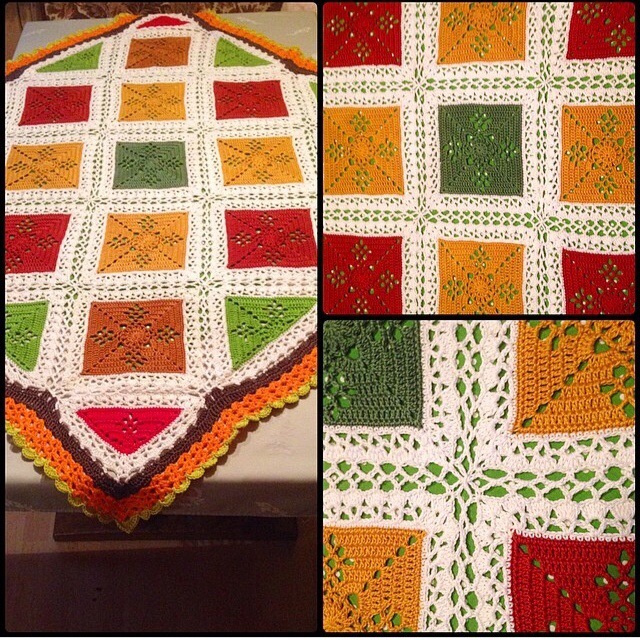 Shreescrochet – These colors are giving me life! Angelala242 – Lovely mix of color! I’m feeling Autumn in the air! 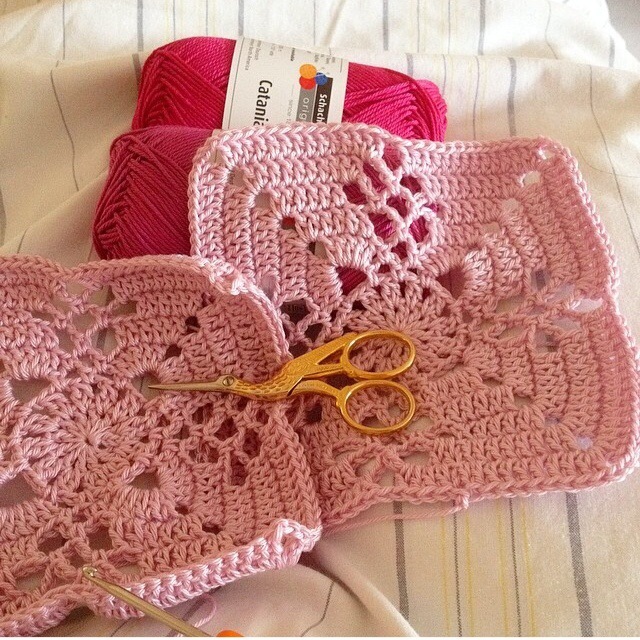 creativemau – Getting funky with the palette – I’m with it! giabets – And another beauty! This palette is amazing. 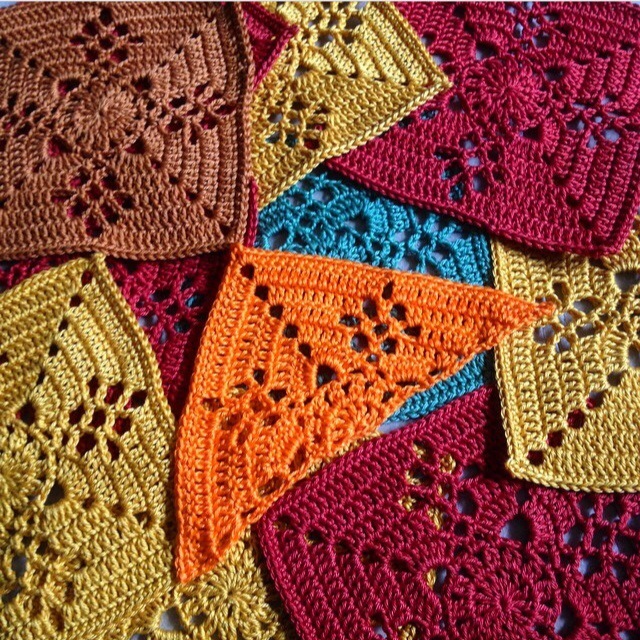 bvchrochet – how gorgeous is this mix? 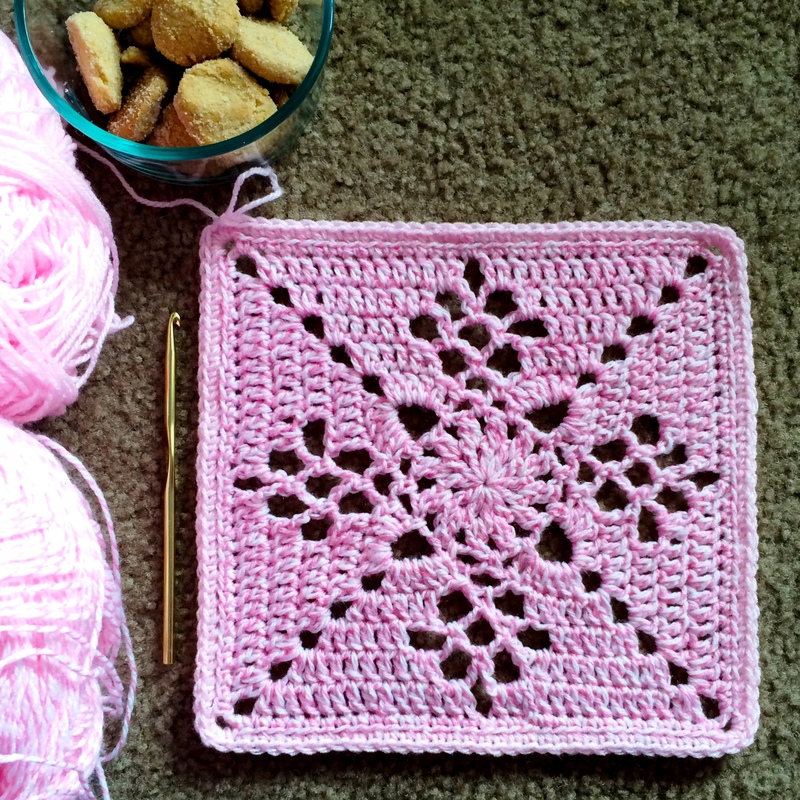 The sandy neutral granny squares is genius! aureliaslittleroom – This makes me want to walk in the grass and soak up the sun! 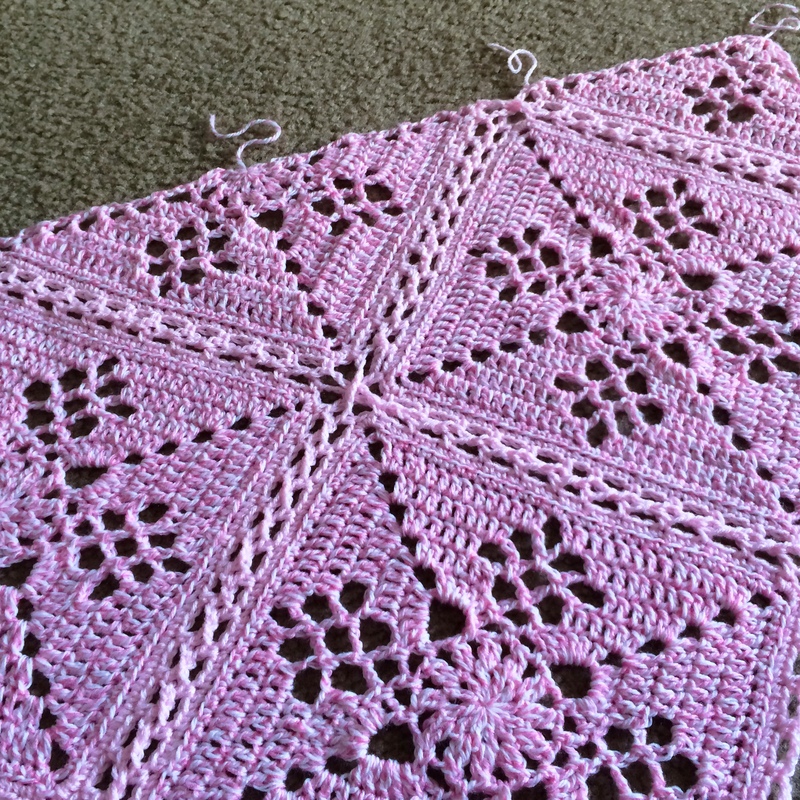 deafmutesew – pretty pastels rule! The touch of color on the edge is so beautiful. 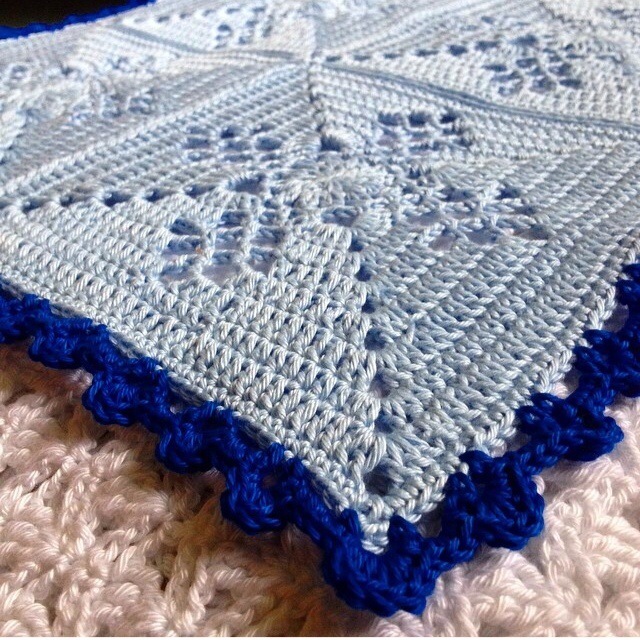 anniedesigncrochet -Another wooden deck that has me nudging my husband’s arm.. Beautiful and just the right place to crochet these beauties! 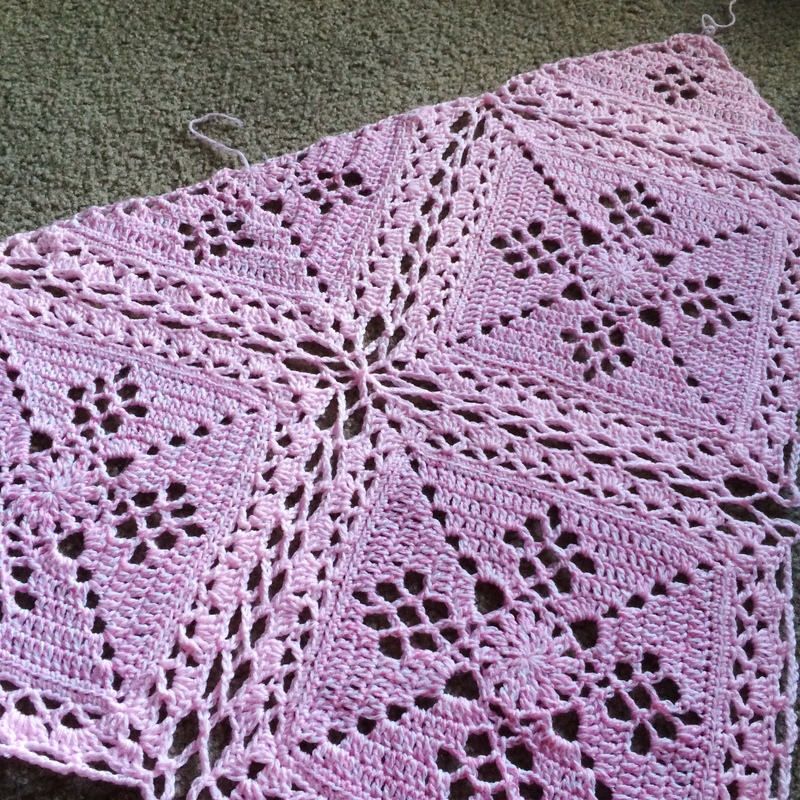 larissakatherine_ – Blown away by this monochrome beauty – can’t wait to see it completed! larissazini – And this fabulous combo – I’m feeling this retro vibe! Gives the square a whole new look. 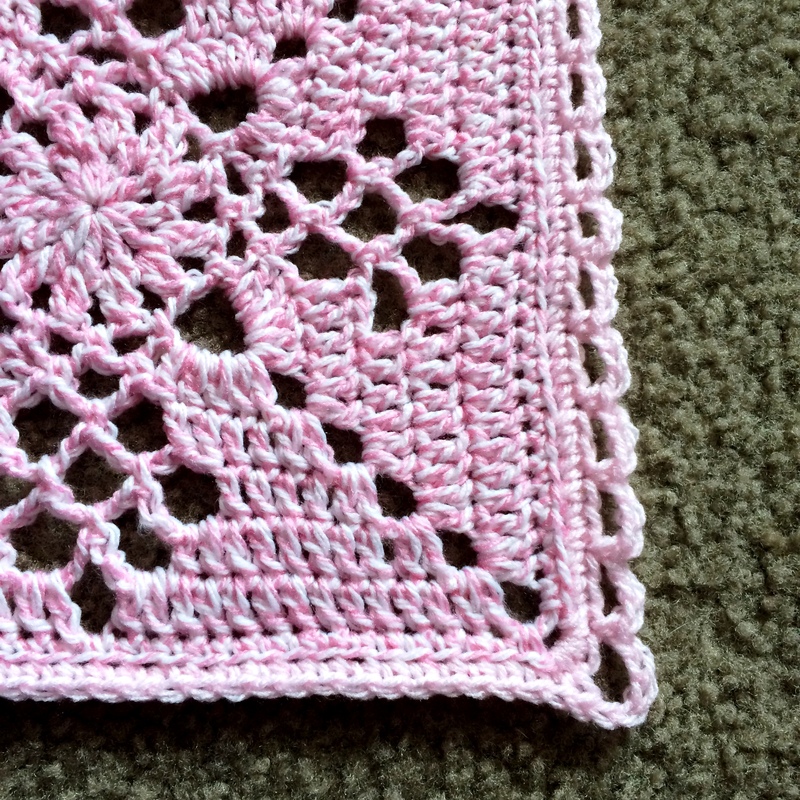 Celtic Lace Join is one of my favorites! Here is a link to the original CLJ post from my website. You may want to take a peek at Option No. 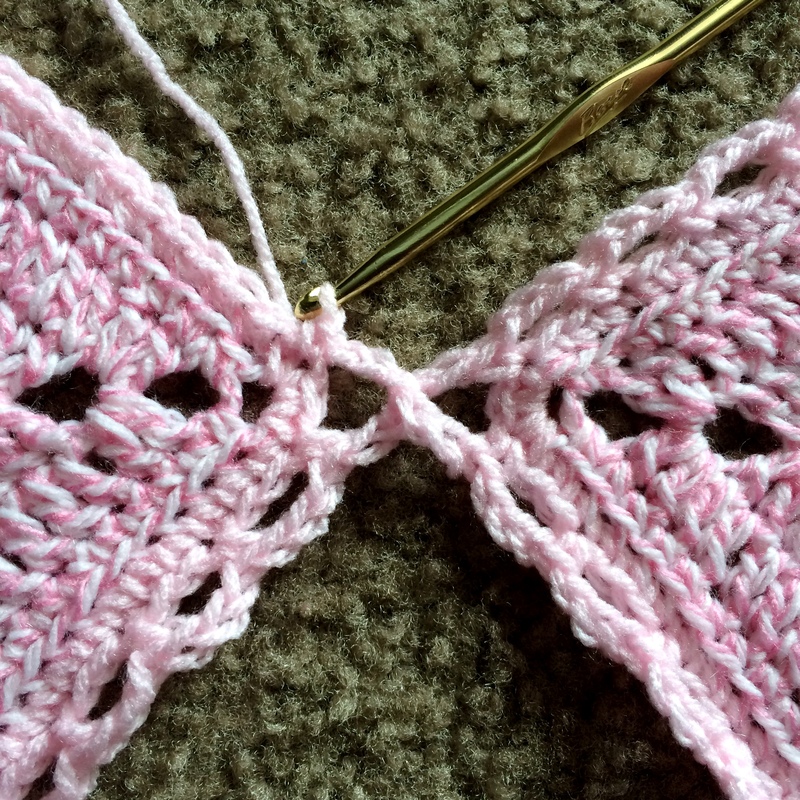 1 – Flat Braid Join. 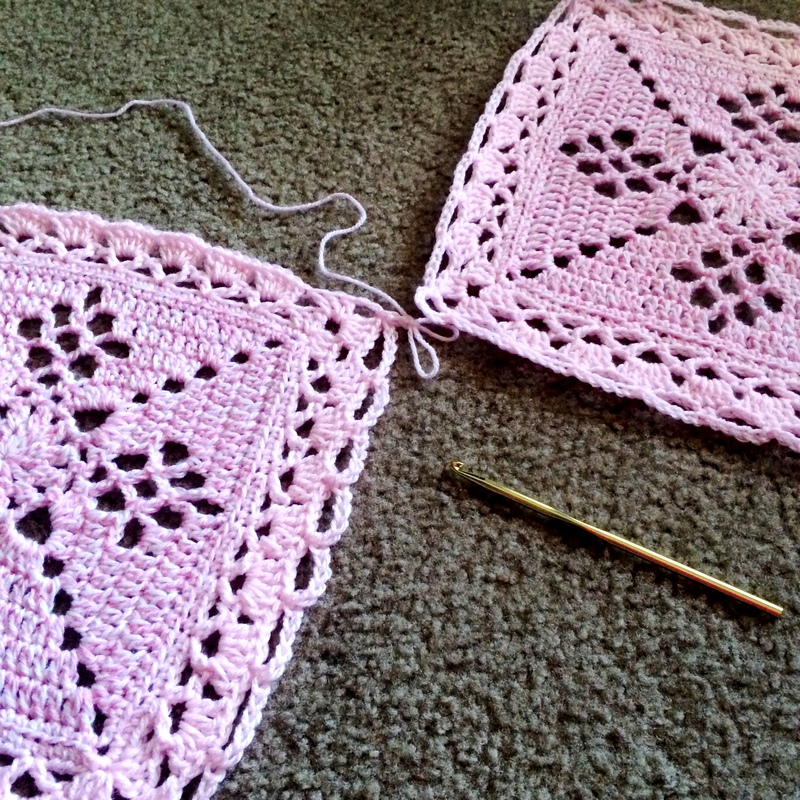 It is an easier join, and you’ll be able to see how the diagonal pieces come together with the partial squares. Again we will be using the layout and joining order in the diagram below. 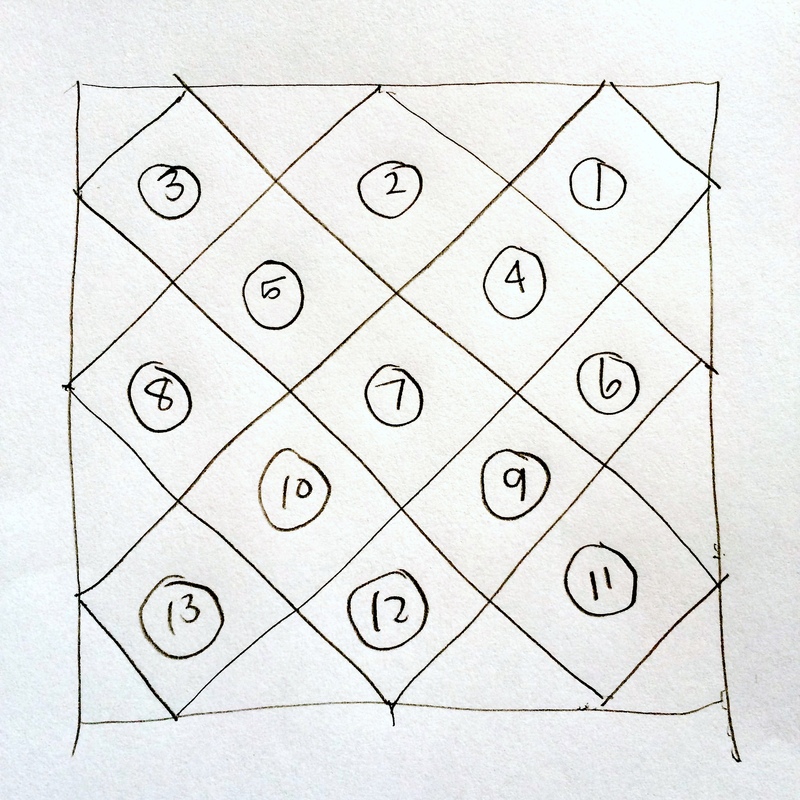 To begin, take square #1. 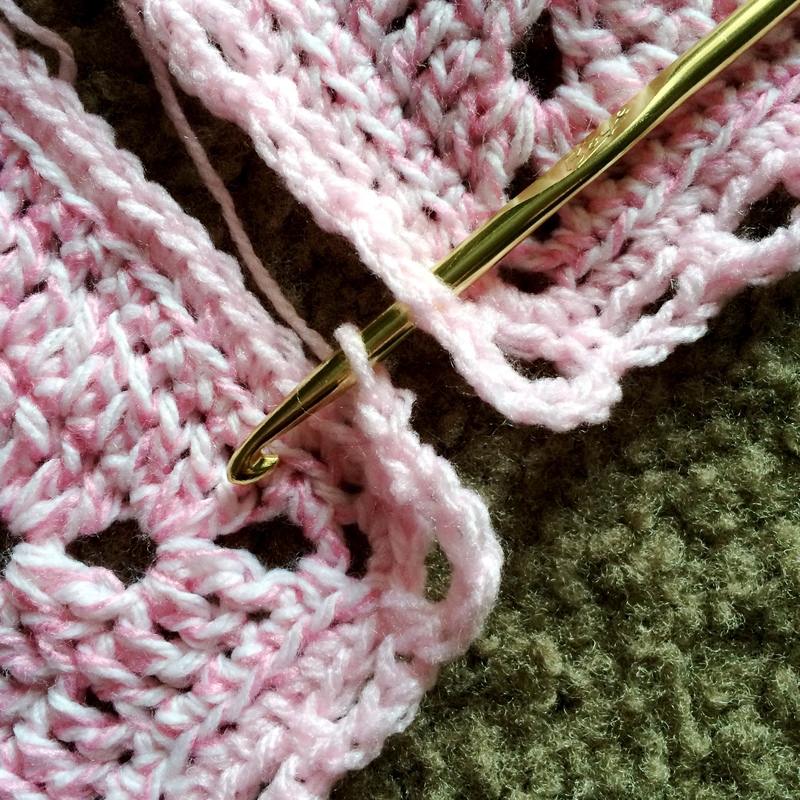 Round 1 (SC round): Join yarn with a slip stitch in any corner loop. 3SC in same loop. SC through back loop only all around, putting 3SC in each corner loop. Join to beginning SC and finish off. Note: When I work through back loop only, to make a more secure stitching, I also grab the horizontal bar located behind the stitch. 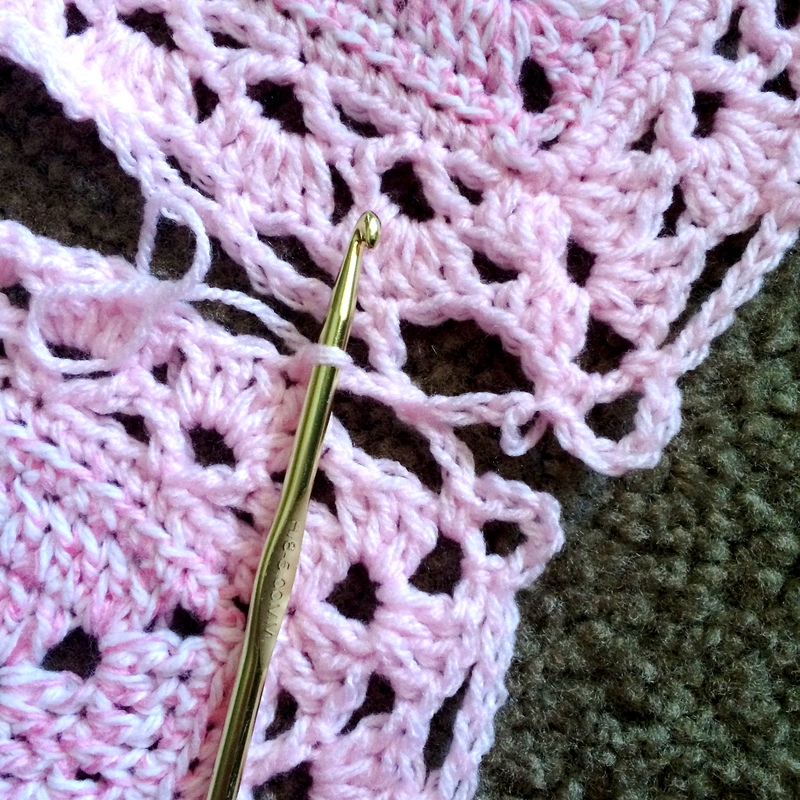 Round 2: SC in center stitch of corner. Chain 4, 2DC all in same stitch. DC in next stitch, **skip 3 stitches, (DC, Chain 3, DC) all in next stitch (V-stitch made). 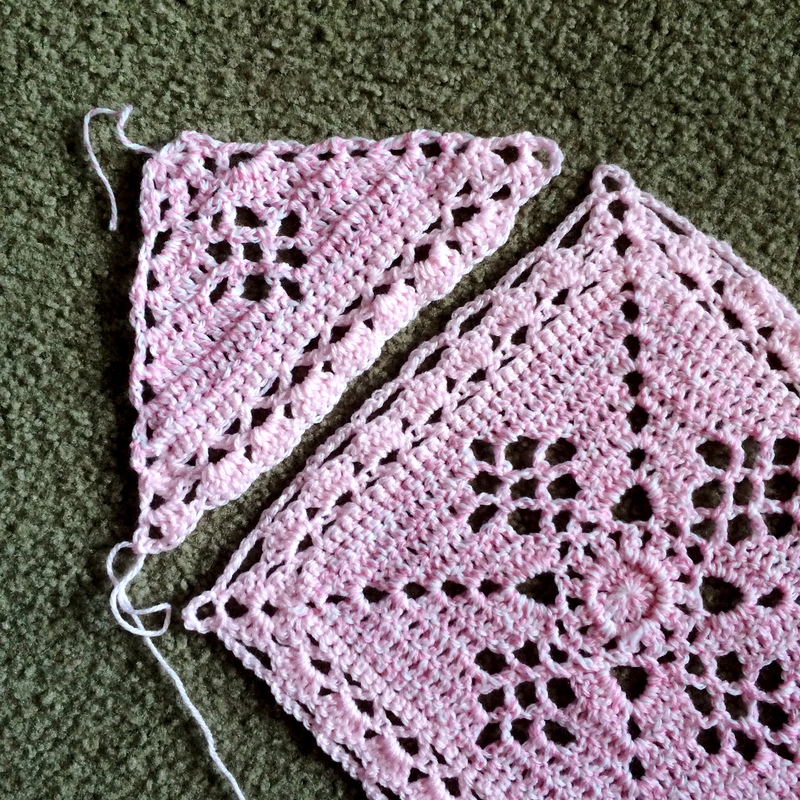 (skip 3 stitches, V-stitch) 6 more times, skip 3 stitches, DC in next stitch, (2DC, Chain 3, 2DC) for corner. Repeat from ** 3 more times around to beginning. 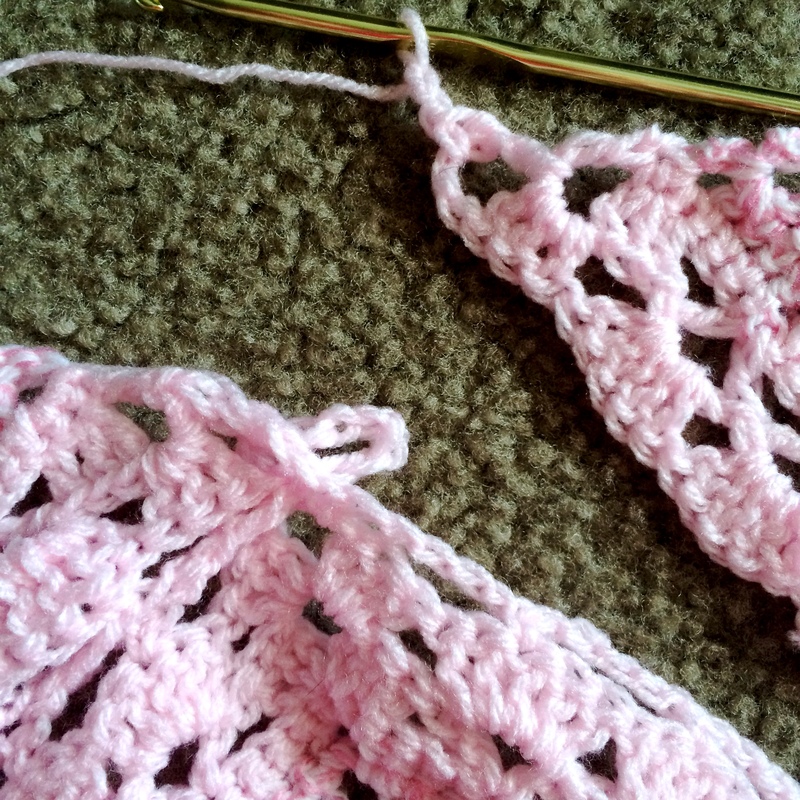 DC in same stitch as first corner, and join to first chain of initial chain 4. Round 3: SC in corner chain loop, Chain 4, 3DC in same chain loop. 5DC in each v-stitch as below, make (3DC, Chain 3, 3DC) corner. Repeat around to beginning, 2DC in beginning corner to complete it. Join in first chain of the initial chain 4. Round 4: SC in the first corner loop, Chain 5, SC in same corner loop. (Chain 5, SC in center DC of 5DC group) 7 times, Chain 5, (SC, chain 5, SC) in corner loop. Repeat around to beginning, and join to beginning SC. Finish off. Take square #2, and work rounds 1-3 like normal. Work one side of round 4 up through 2 chains of the 5-chain second corner. Line up the motifs ready to join. See photo below. 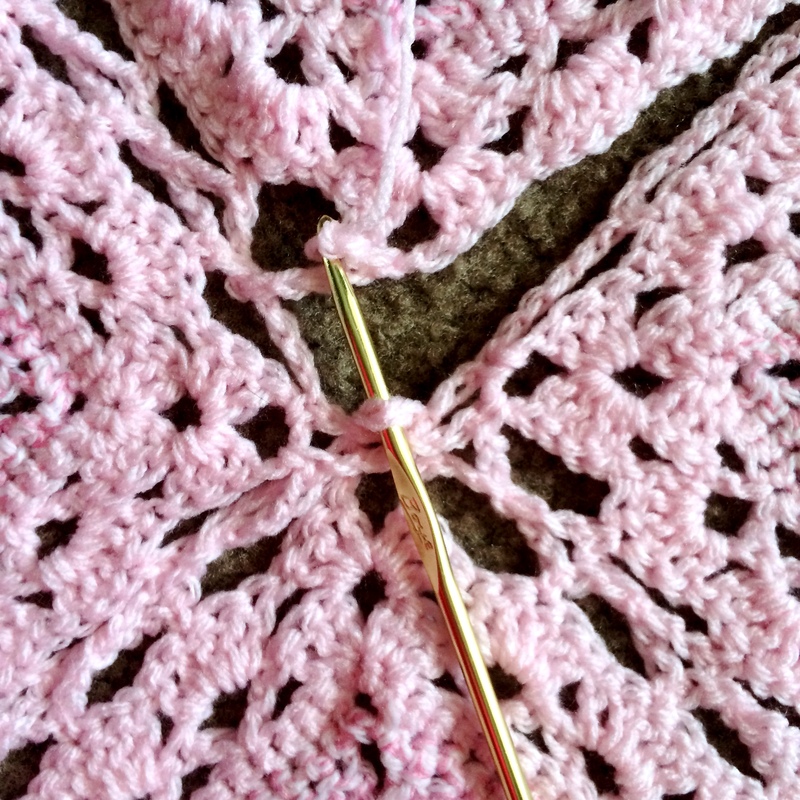 Release the loop from your hook, insert hook in the corner loop of motif #1, put the loop back on your hook. 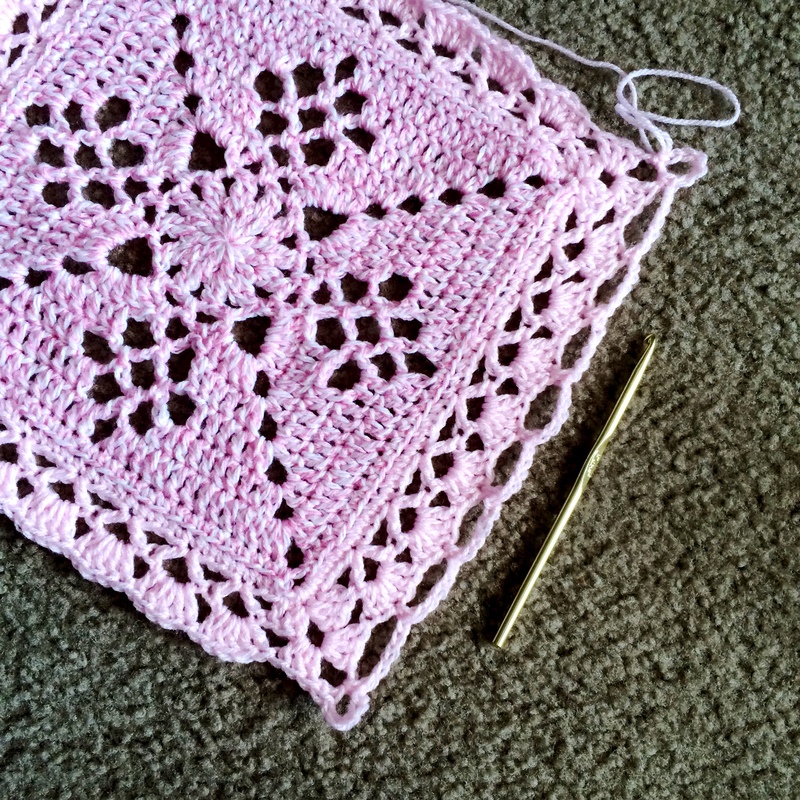 Finish the 3rd chain stitch in your corner, Chain 2 more. SC in same corner of motif #2, chain 2, perform join by releasing loop from hook, inserting hook in corresponding loop on completed motif, and putting the loop back on your hook. Here is a zoomed out photo of where you should be. And here is a zoomed in shot. Here, you’re ready to complete your center chain of the 5-chain loop. This is how your joins will be performed. I’ll label it as FBJ from now on, since it is the same process as the Flat Braid Join. 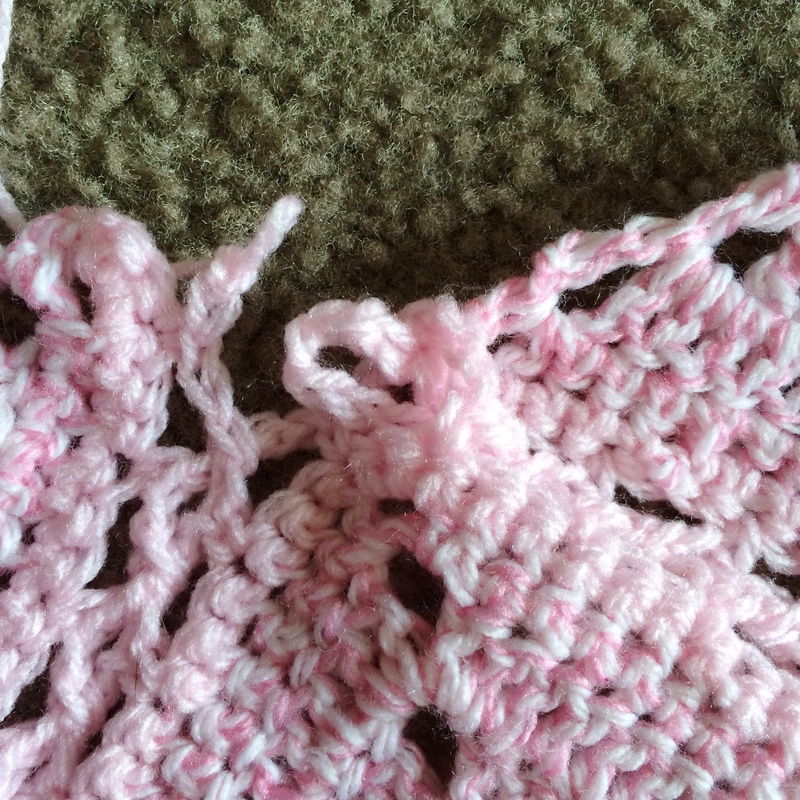 Complete your chain, chain 2 more, and SC in center stitch of 5 DC group. 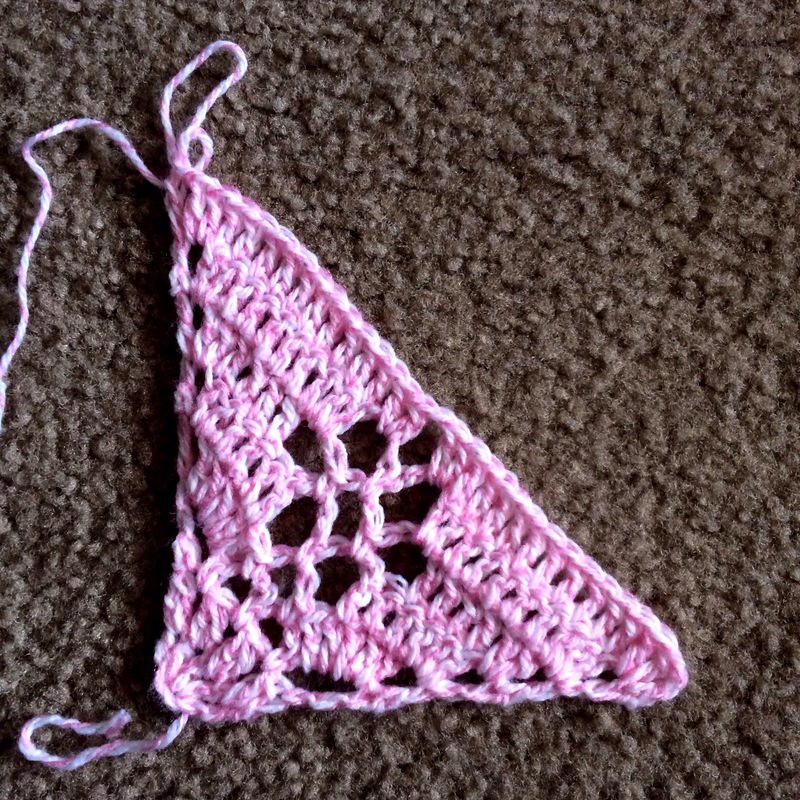 Chain 2, FBJ to next loop on completed motif, Chain 2, SC in center stitch of next 5DC group. Continue in this manner until all 7 chain loops are joined up. SC in corner loop, Chain 5, SC in same corner loop. Now, work down the third side, joining all 7 loops. (SC, Chain 5, SC) for final corner, work side 4 plain, join in beginning SC, and finish off. Notice which corners are joined and which are not. The un-worked corners will be picked up by their diagonal buddies when those squares are joined. 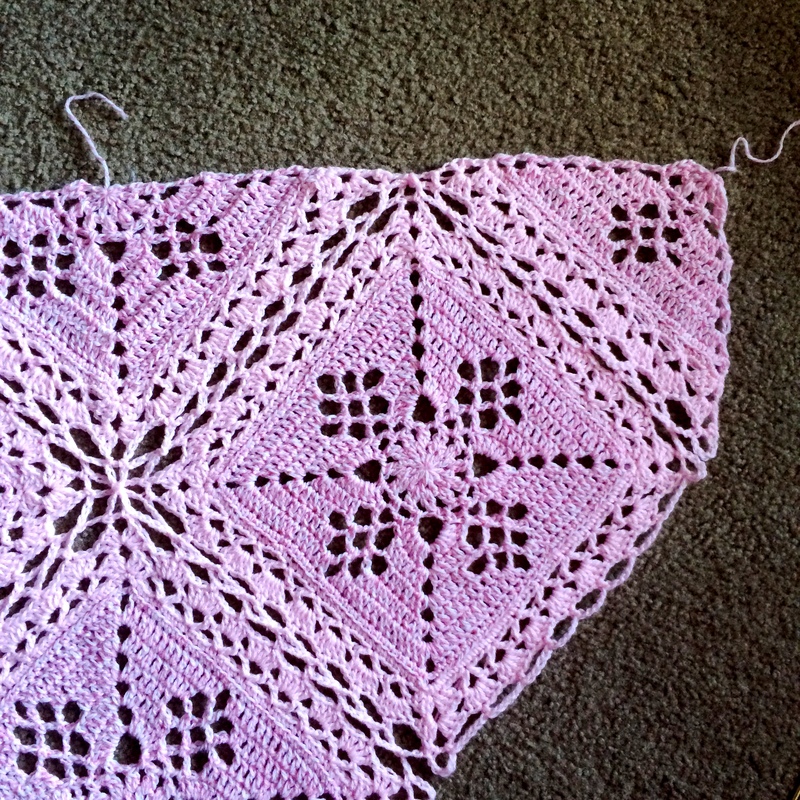 Row 1: with right side facing, Join yarn in first corner loop. 3SC in same corner, SC through back loop only across, 3SC in final corner, turn work. 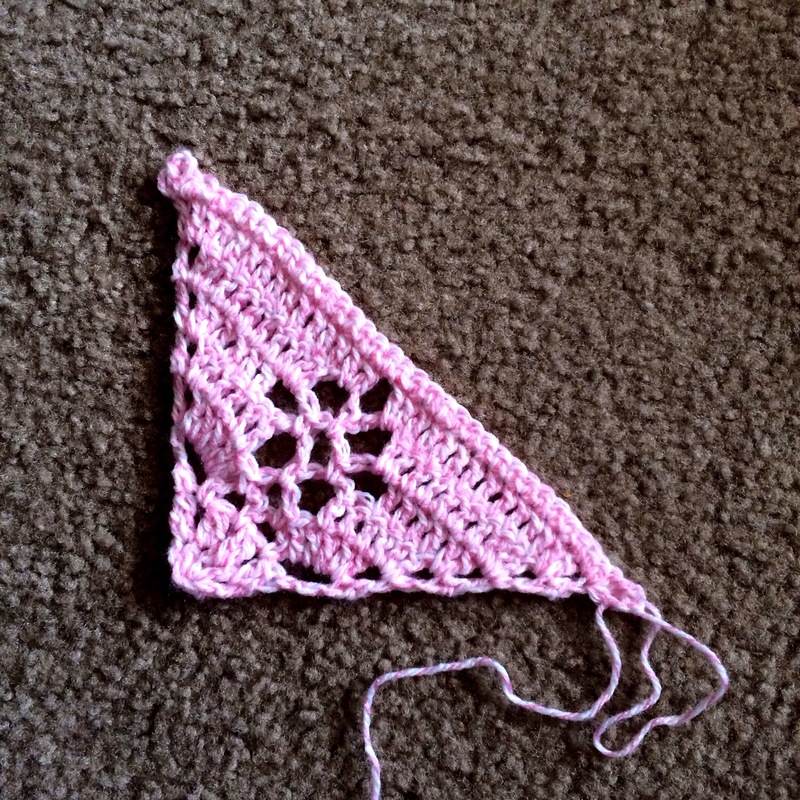 Row 2: SC in center stitch of corner. Chain 4, 2 DC in same stitch, DC in next stitch, (skip 3 stitches, V-stitch) 7 times, skip 3 stitches, DC in next stitch, (2DC, chain 3, DC) in center stitch of corner. Turn work. Row 3: SC in chain 3 loop, chain 4, 3 DC in same chain loop, 5 DC in all 7 V-stitches across, (3DC, Chain 3, DC) in final chain loop. Turn work. 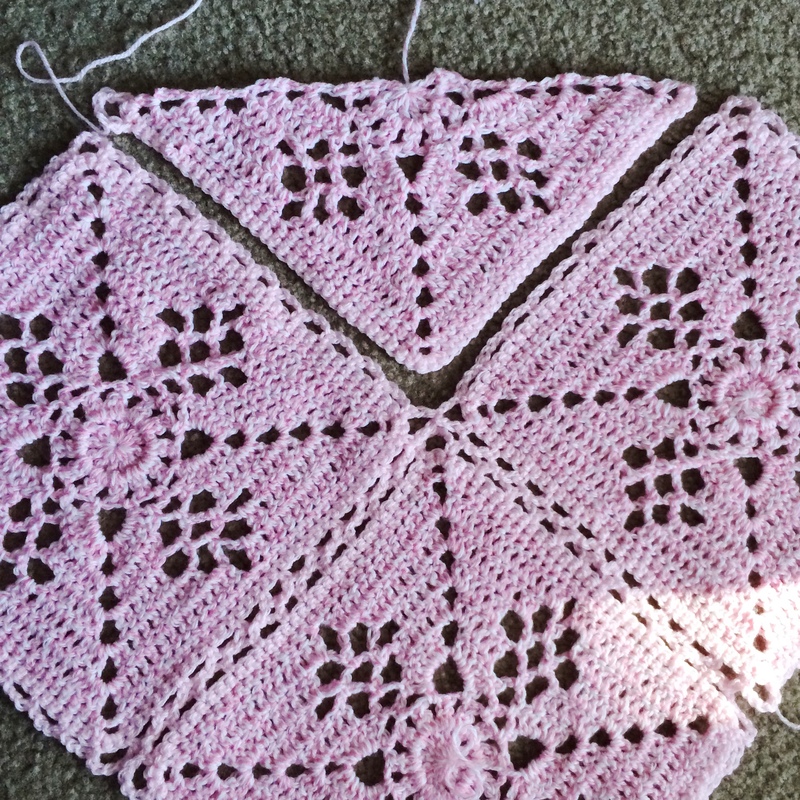 You can see I have now flipped the entire work so I can join the partial motif, since this row is worked with wrong side facing. 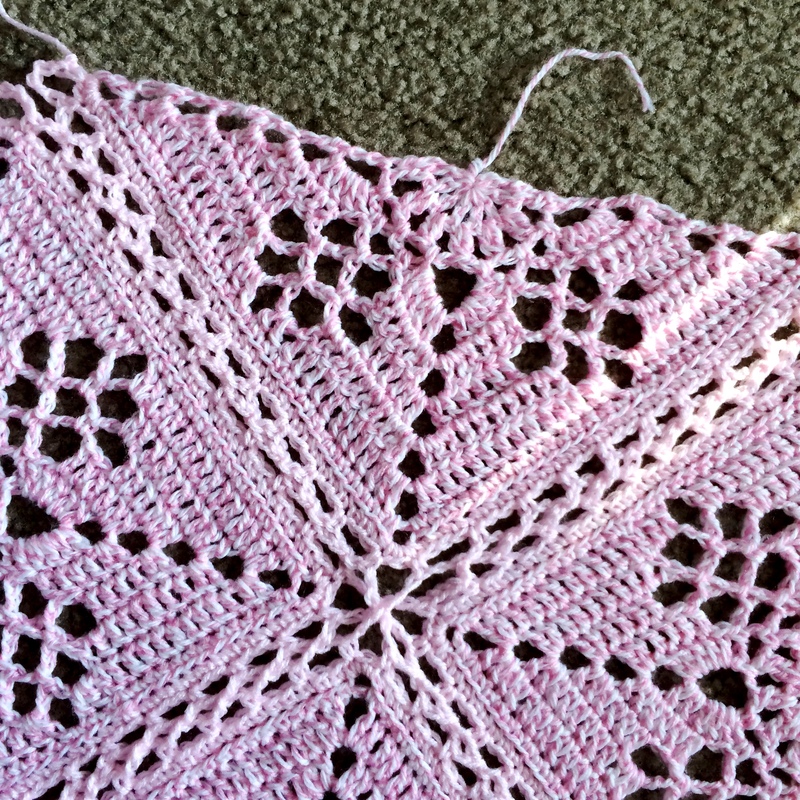 You can hardly tell the difference, and it saves so many yarn ends to just turn the work! Row 4: SC in chain loop, chain 5, SC in same chain loop, (chain 2, FBJ, chain 2, SC in center stitch of next 5DC group) 7 times to join all loops. (SC, chain 5, SC) in final corner, finish off. Flip work to right side and admire your work!! 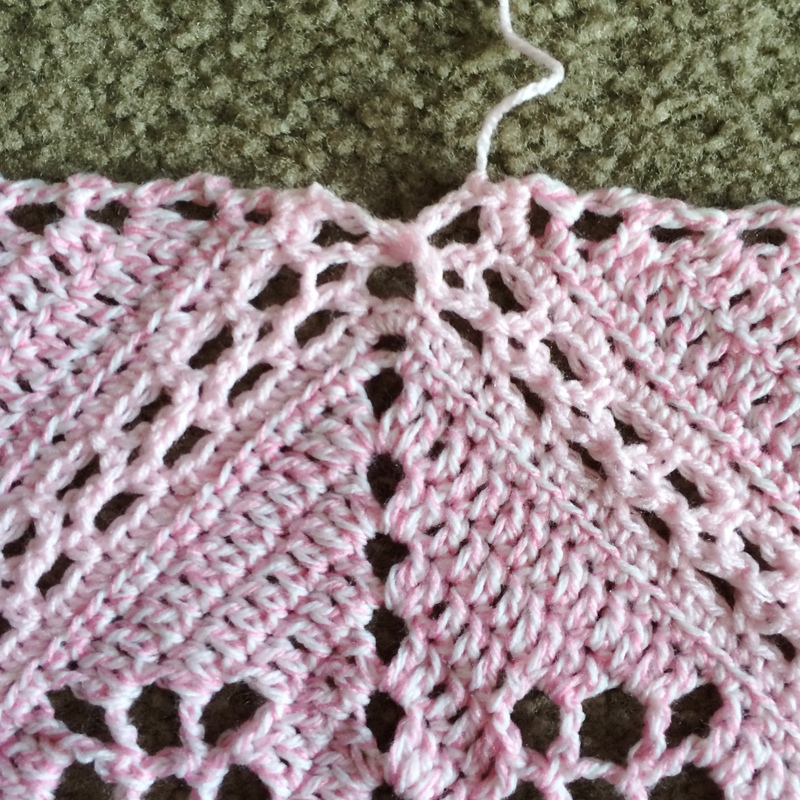 Row 1: With right side facing, join yarn with a slip stitch in first corner loop. 3SC in loop, SC through back loops only in all SC, putting 3SC in following 2 corners, turn work. 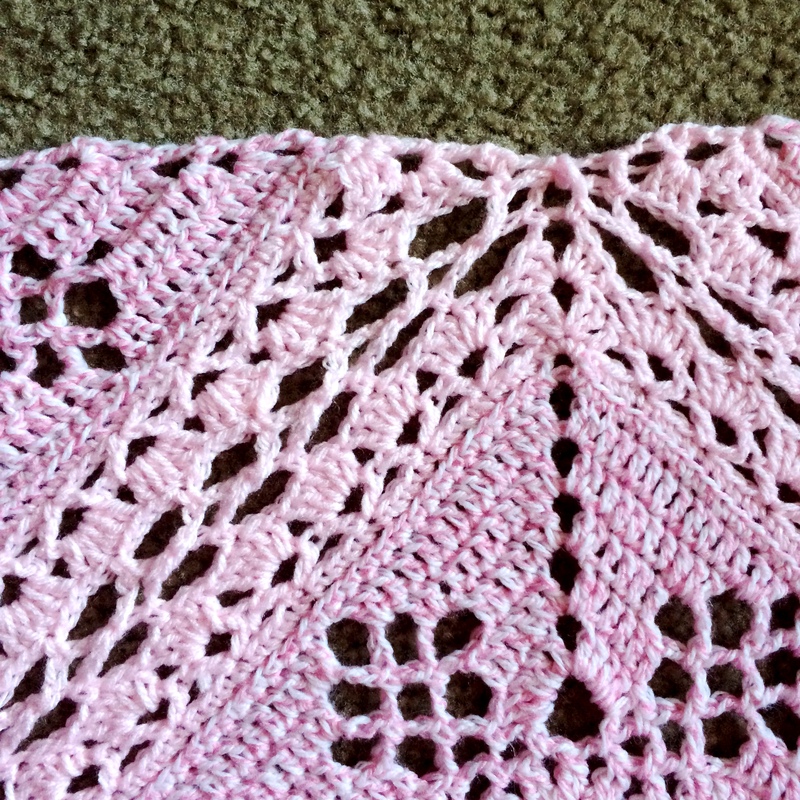 Row 2: SC in center SC of corner, Chain 4, 2DC in same stitch, **DC in next stitch. 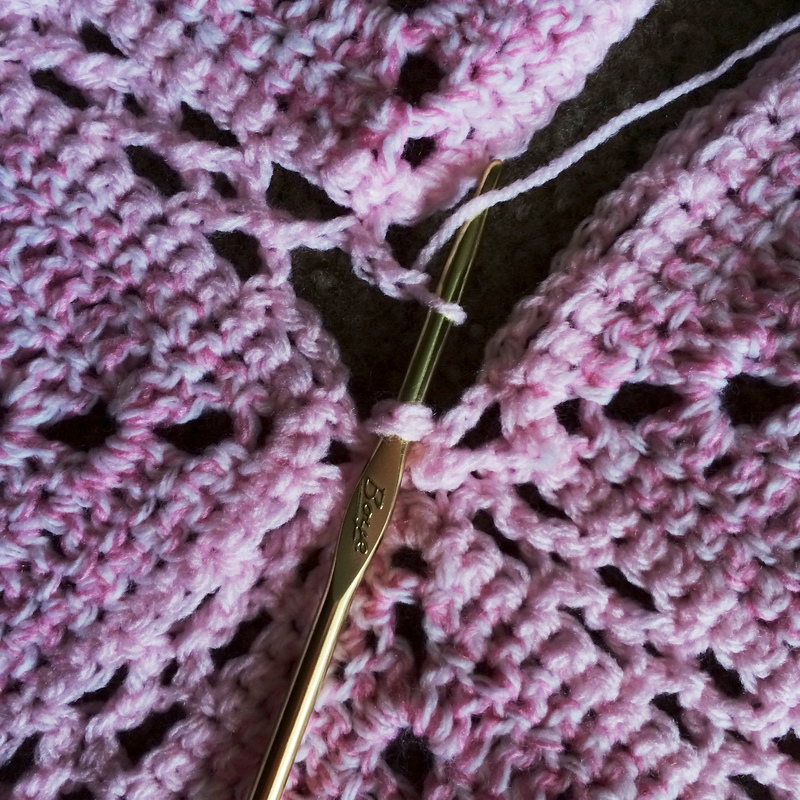 (Skip 3 stitches, V-stitch in next stitch) 7 times, skip 3 stitches, DC in next stitch, (2 DC, chain 3, 2DC) in corner stitch, repeat from ** to end, putting (2DC, chain 3, DC) in final corner. Turn work. Row 3: SC in corner chain, chain 4, 3 DC in same corner chain, 5 DC in all V-stitches across, (3DC, chain 3, 3DC) in corner chain, 5 DC in all V-stitches across, (3DC, chain 3, DC) in final corner. Turn work. Flip entire work as before, and line up, getting ready to join. Here’s a close-up of what you should be looking at. We’re about to do some fancy footwork with this join! 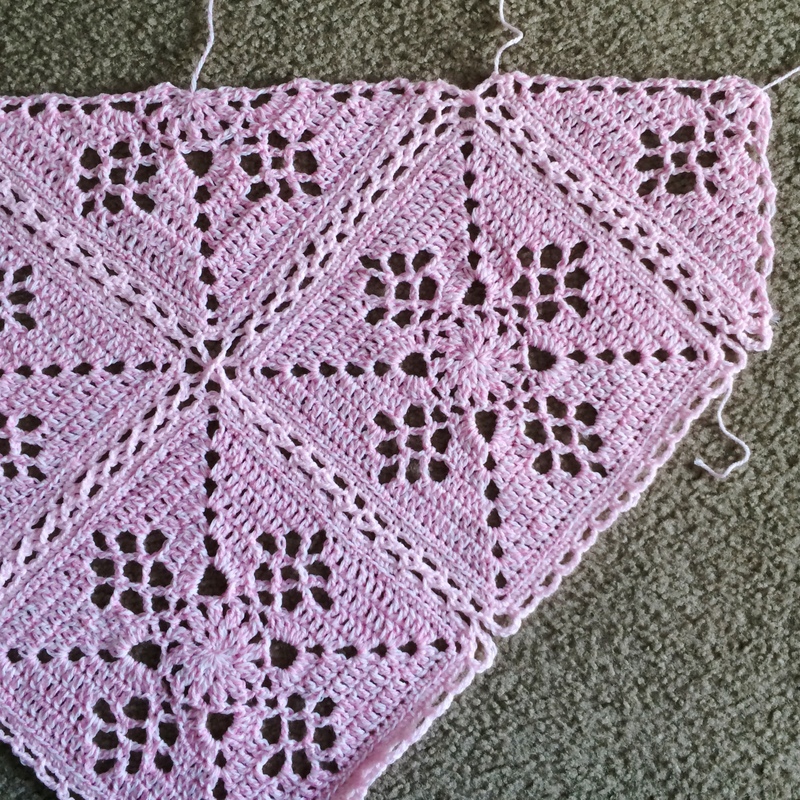 It may be a little tough to see in the photo, but I have pulled the loop from the left hand motif *through* the center loop, that way when I join the half-motif, the center loop won’t be left un-worked. SC in the corner loop, chain 2, FBJ in the loop that you pulled through, chain 2, work down this side as you have been, up to the center corner. Work the 5-chain corner, pausing to FBJ on the center chain. Remember, you are working on the wrong side of the piece, so on the front side, you need to have vertical corner joins lying on top. 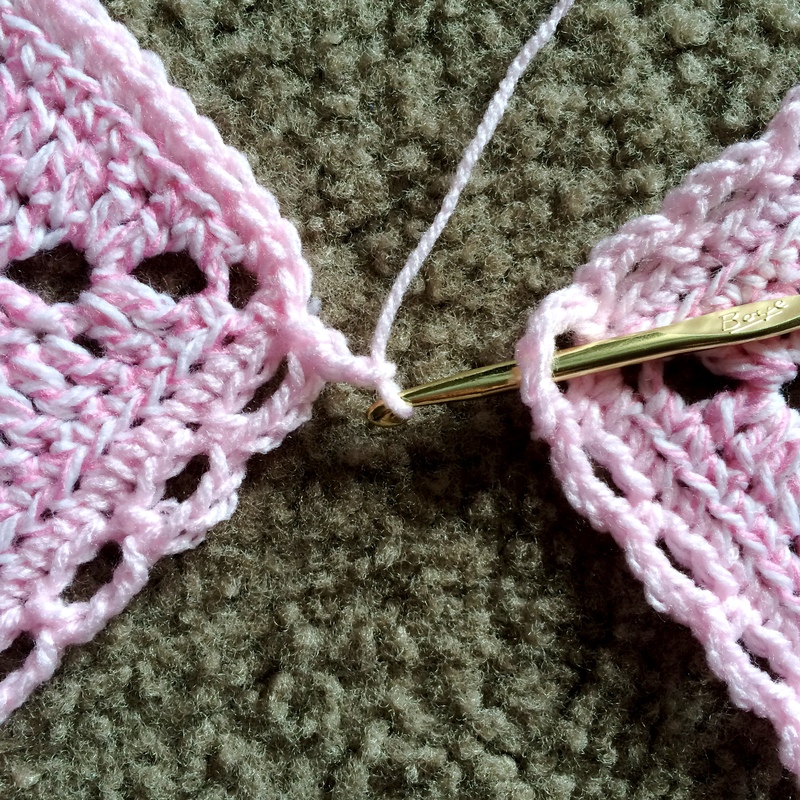 To make this happen, scoop up that un-worked corner loop from the motif below, and insert your hook in it from behind the horizontal corner join you can see this in the photo below. The chain is ready to be pulled through the completed loop for the FBJ. Work back up the other side of the half-motif, and leave the final corner loop un-worked because it will be picked up when you attach your next half-motif. Pay attention in the photo below to which corners are worked and which aren’t. In the photo, I have flipped the work back to the right side facing.. You can see that the join where we pulled the loop through is worked, and the rest are awaiting their diagonal counterparts. 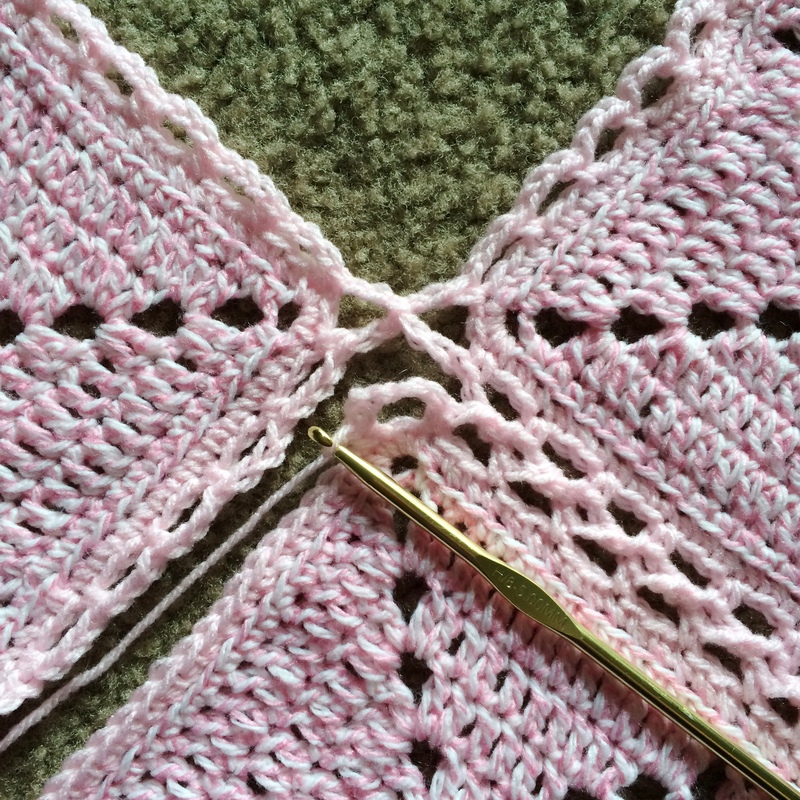 Don’t forget that the vertical joins need to be lying on top when you cross your corners. You could also put all of the horizontal joins on top – the main point is to make them all the same. I hope y’all enjoy this join! 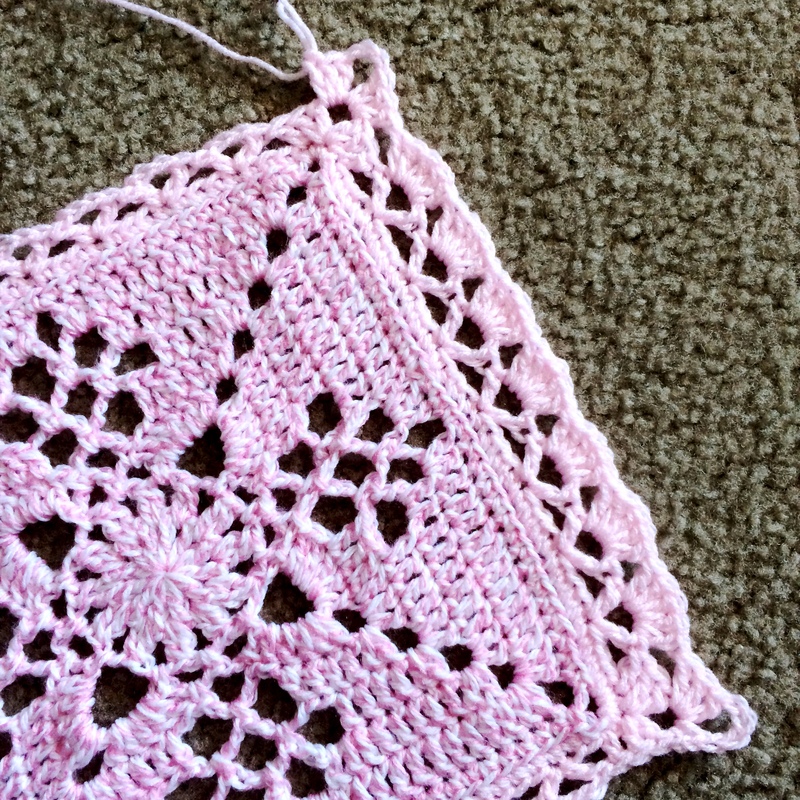 I just love it, and although joining partial motifs and this diagonal business seems intimidating, it’s truly a new way to freshen and appreciate the square motif! 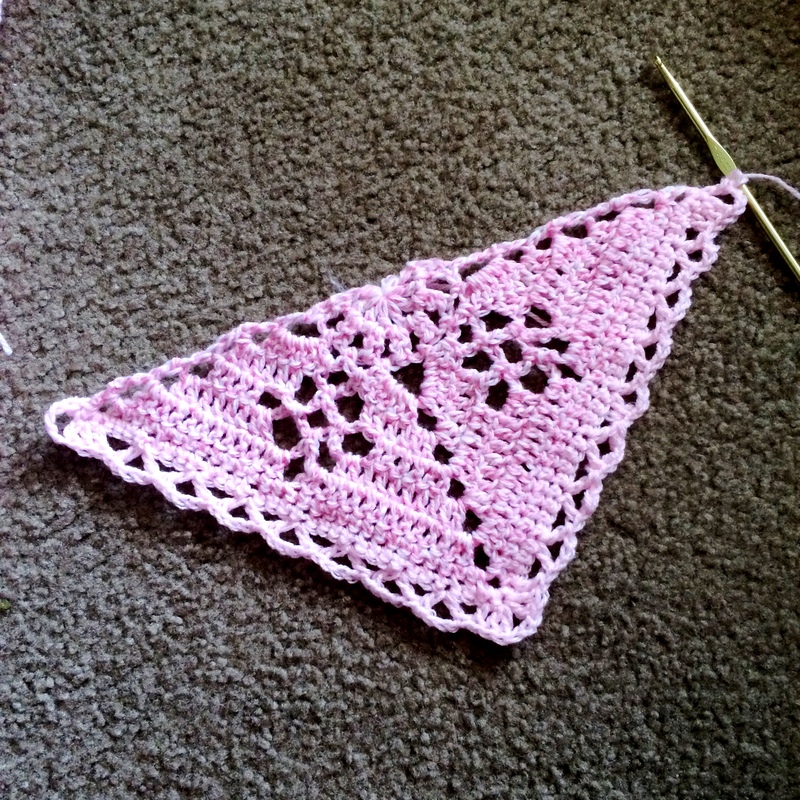 I have had a very long love affair with the hexagon, to the point where squares just didn’t do it for me anymore. 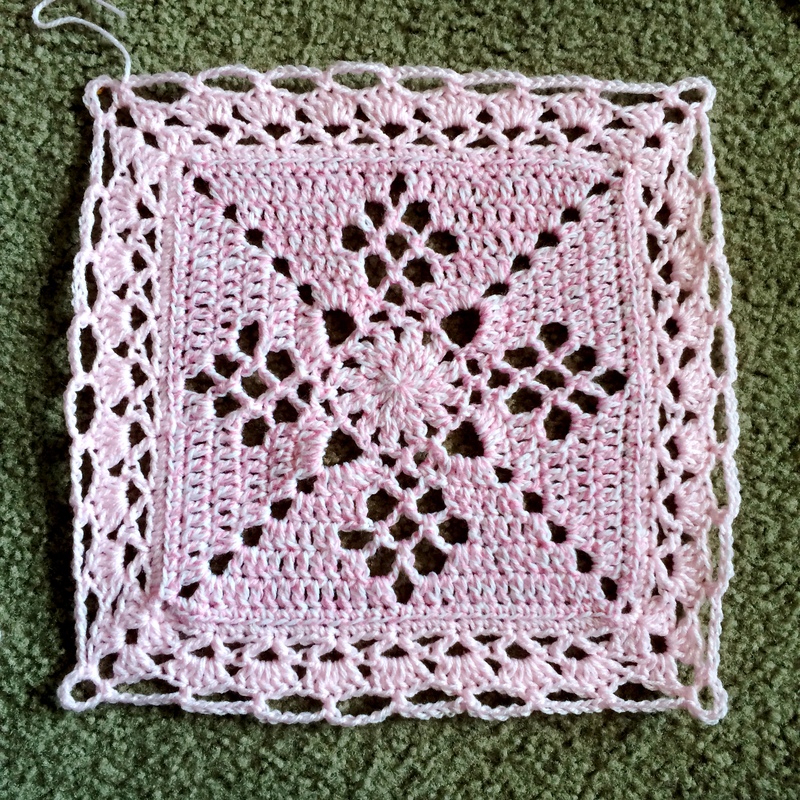 But now, by turning the square on the diagonal and chopping motifs up into partial motifs, I’m in love with the square once again! Welcome back to the MysterySquare2014 CAL! Now it’s time to join our squares. And it’s a Choose Your Own Adventure 🙂 (Remember those books??) 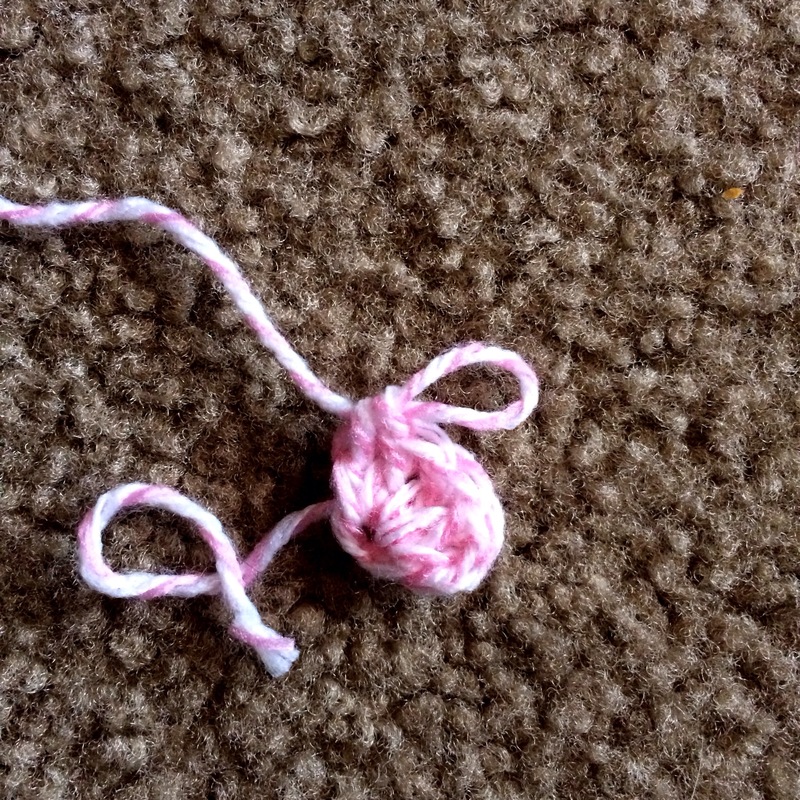 Today, I will go over the first option for joining: the Flat Braid Join. 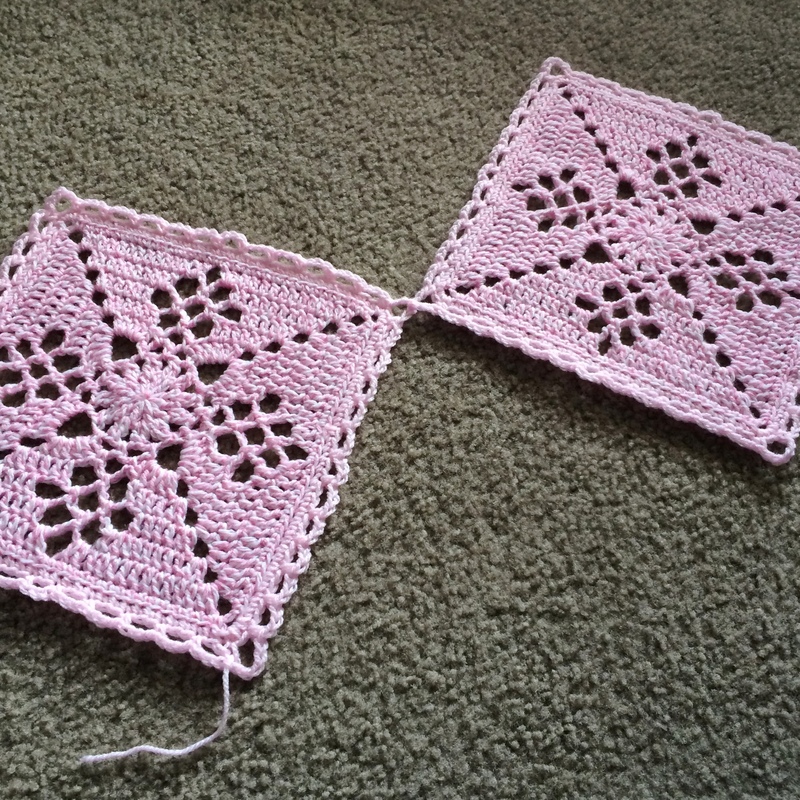 In Part 2 of this installment, I’ll demonstrate the other two joining options: Celtic Lace Join and Continuous Flat Braid Join. 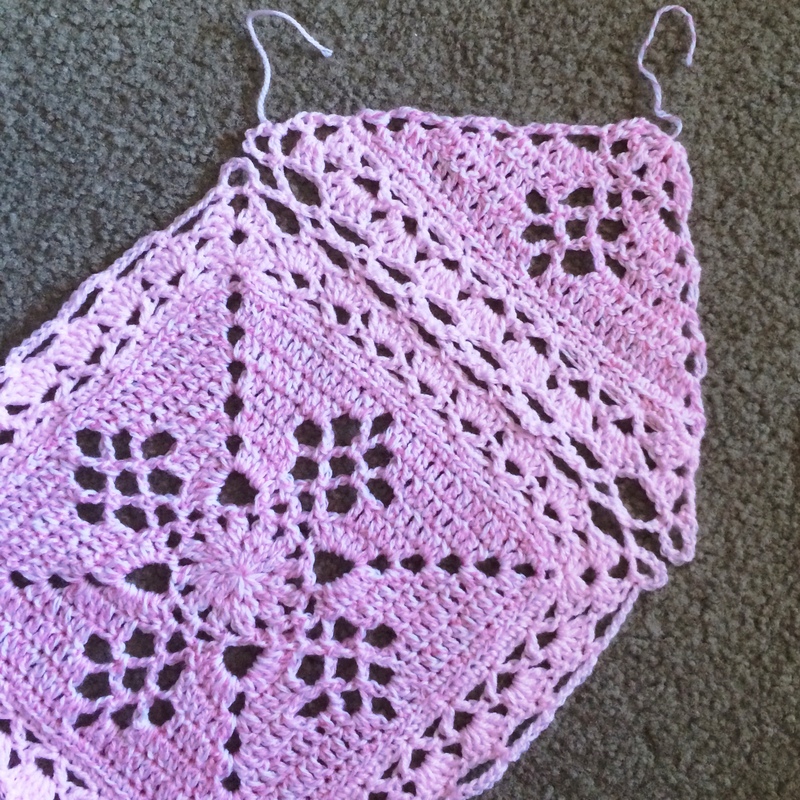 Here is a photo of the Flat Braid Join. If you love it, then follow along with me today! If you love it, and you’re also feeling adventurous, then wait for the Continuous version of this join, which I’ll show tomorrow. 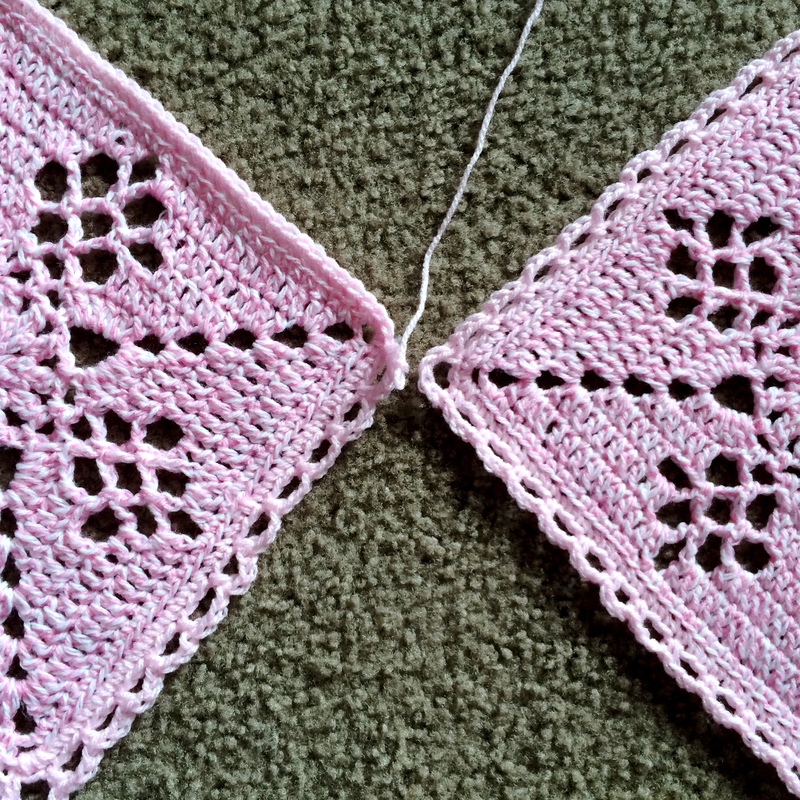 And here is an example of the Celtic Lace join I’ll show tomorrow – of course if you’re following along with me, you’ll have motifs oriented diagonally. Choose your join wisely… just kidding! Go wild!! 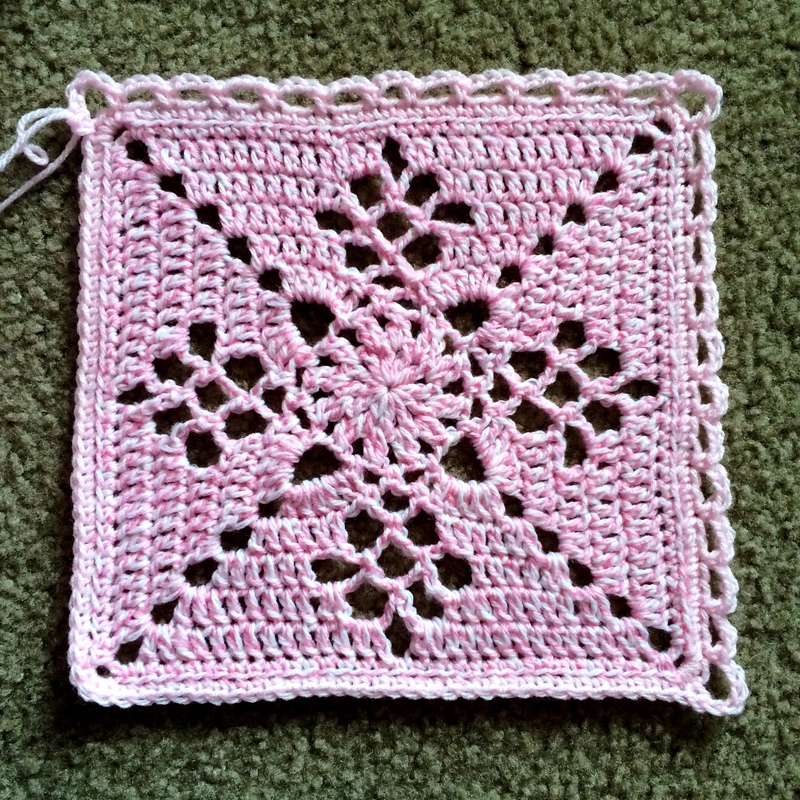 I think everyone has their squares and partial squares all arranged? Here is a drawn diagram with the placement and numbers labelling the joining order. 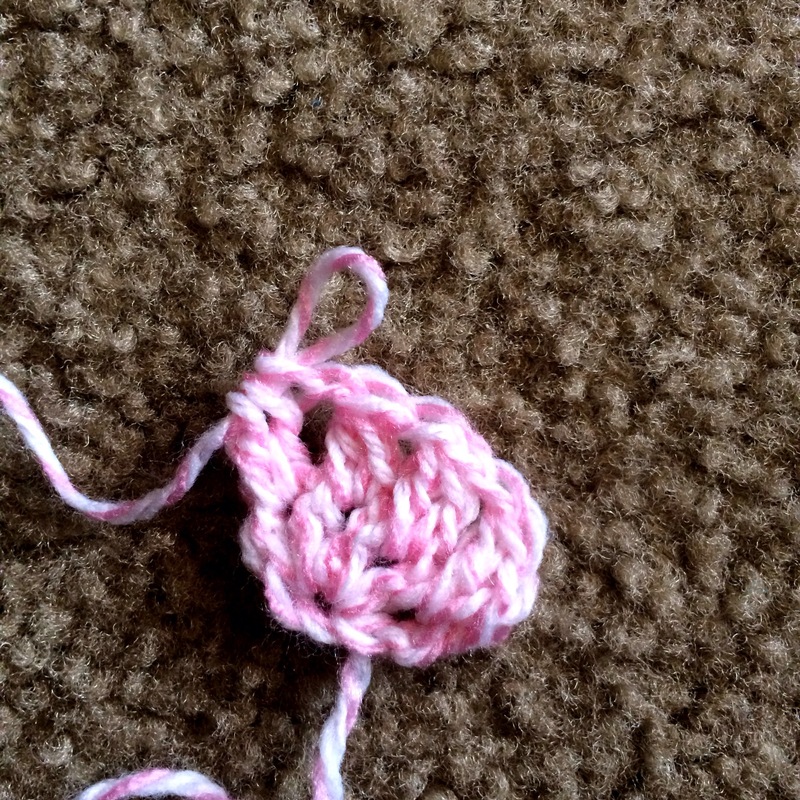 Round 1 (SC round): Attach joining yarn with a slip stitch in any corner. 3SC in same corner loop, SC through back loop only around in all stitches, putting 3SC in each corner loop. Join in first SC. 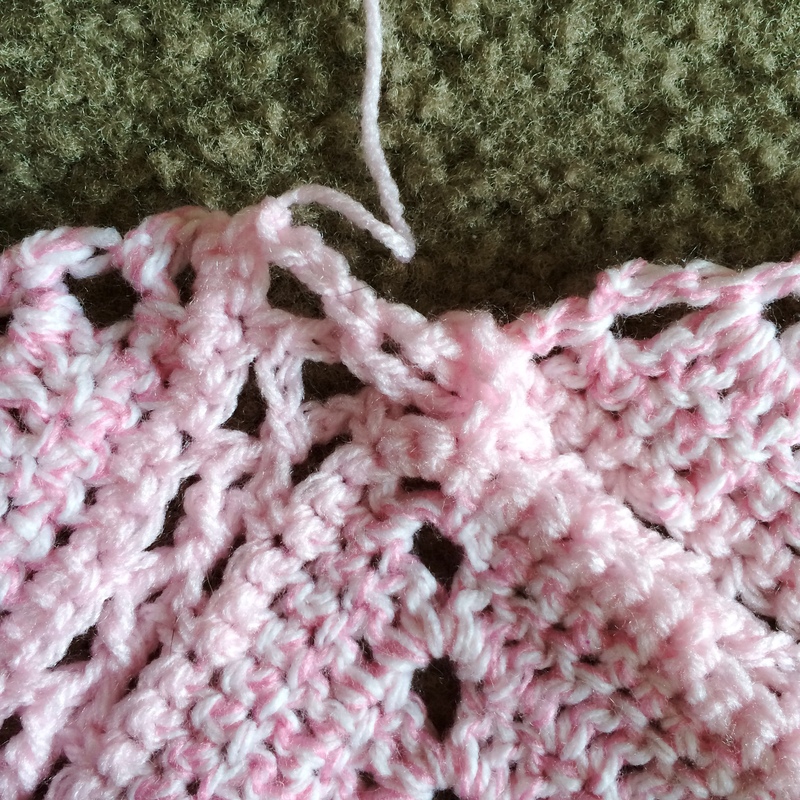 Note: When I work through back loop only, I also pick up the horizontal bar that lies behind the stitch, for added support. It looks identical, but it’s much stronger. 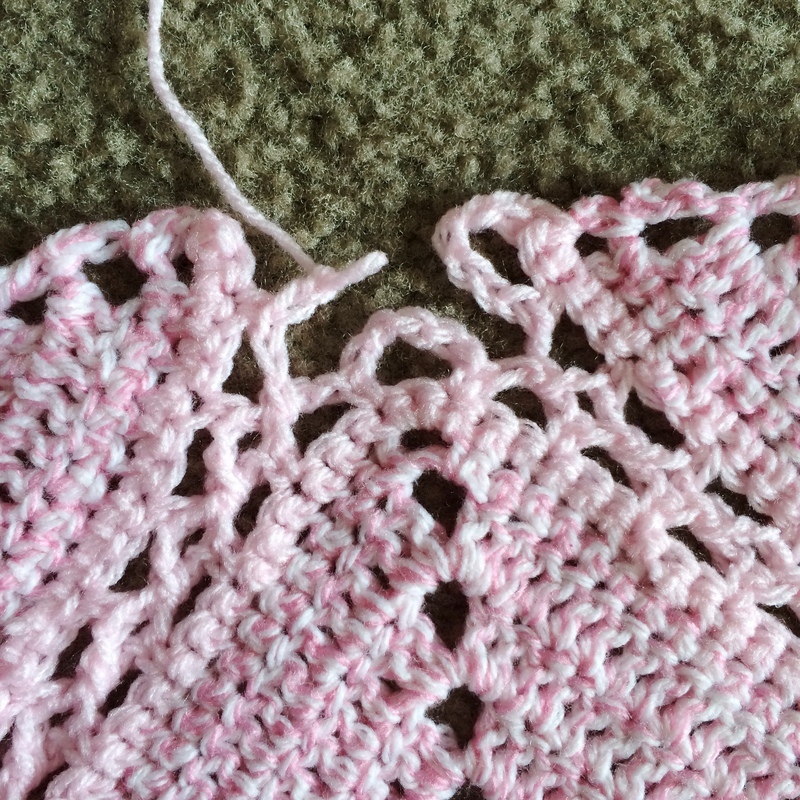 Round 2 – first motif only (Chain loop round): SC in same stitch as join. 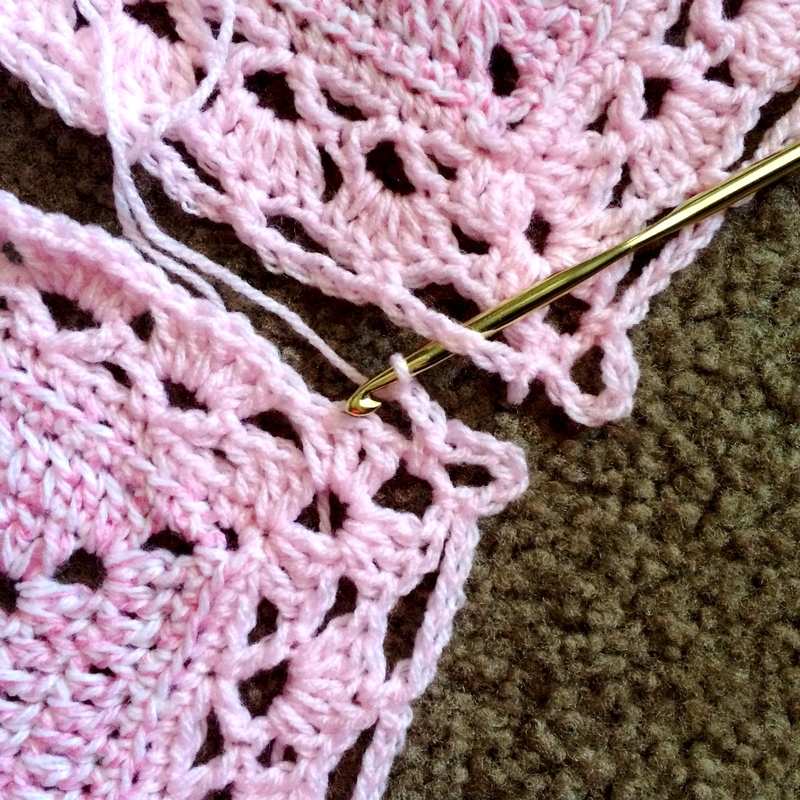 **Chain 5 (corner chain), skip 1 stitch, SC in next stitch. (Chain 3, skip 2 stitches, SC in next stitch) 5 times, Chain 3, skip 1 stitch, SC in next stitch, (Chain 3, skip 2 stitches, SC in next stitch) 5 times, repeat from ** 3 times. Join in beginning SC. Finish off. Motif #2: Work round 1 as before. Work one side of round 2 as before, up through 2 chains of the 5-chain corner. Line up your motifs as below, keeping in mind the placement in the diagram above. Here is how your make the joins in your Flat Braid Join. I’ll call this maneuver “FBJ” from now on: Take off the loop from your hook, insert your hook in the opposing chain loop from the completed motif, and put the loop back on your hook. Now, pull that loop through and complete your chain “around” the completed chain loop. 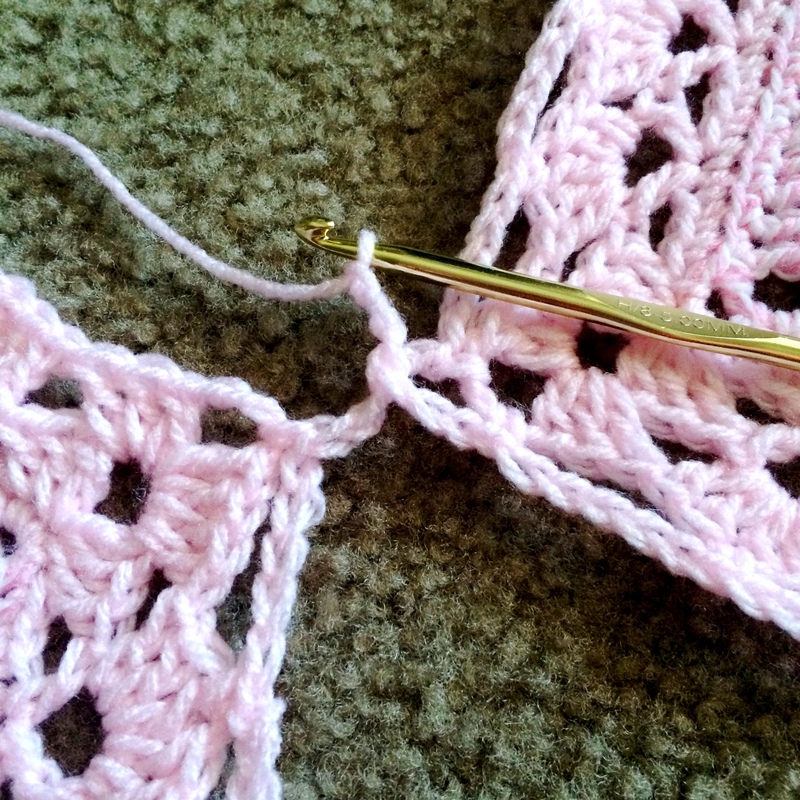 Complete the corner chain by making 2 more chains, skip 1 stitch, and SC in the next stitch just like Motif #1. Keep going around Motif #2, finishing Round 2 as before. Motif #4: Work round 1 as normal, and work round 2 up through the first side, plus, complete the second 5-chain corner, SC, and chain 1. FBJ in the first chain-3 loop just like in the photo below. Make 1 more chain to complete the chain-3 loop. Work across, making your chain-3 loops, stopping to FBJ in each loop as below. When you get to the top corner, make the 5-chain loop, but leave it un-joined for now. 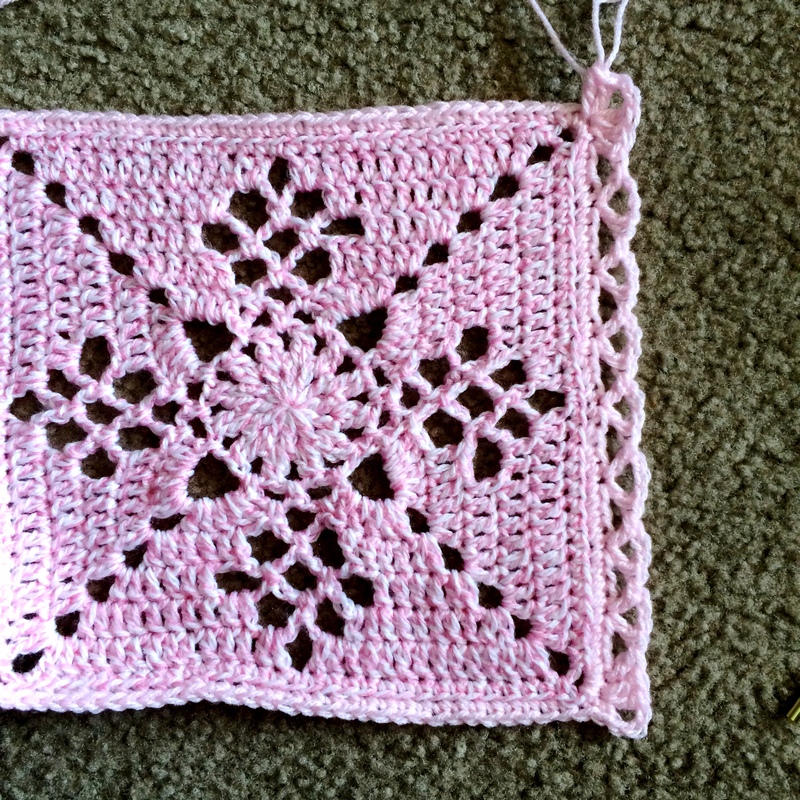 Work side 3 of Motif #4 as below, and work the fourth chain-5 corner, leaving it un-joined (see below). Work final side as normal. Motif #5: Join just like Motif #4, but when you work the second 5-chain corner loop, FBJ the 3rd chain of the loop to the 4th corner of Motif #4. Leave the 1st corner of motif #2 un-joined. Work side 3 of this motif, joining it to Motif #3. All subsequent motifs (#6 – #13) will be worked in this manner. Some join to only 1 side, some join to 2 sides. Leave corner loops un-joined until the diagonal corner loop comes along to FBJ. Make sure to keep the vertical joined loops on top when you pick up diagonal loops. Row 2: SC in first stitch, chain 5, skip 1 stitch, SC in next stitch, chain 1, FBJ in corresponding loop, chain 1, skip 2 stitches as normal, SC in next stitch. Continue down side 1, SC and chain 2 for corner loop. Look at the photo below. 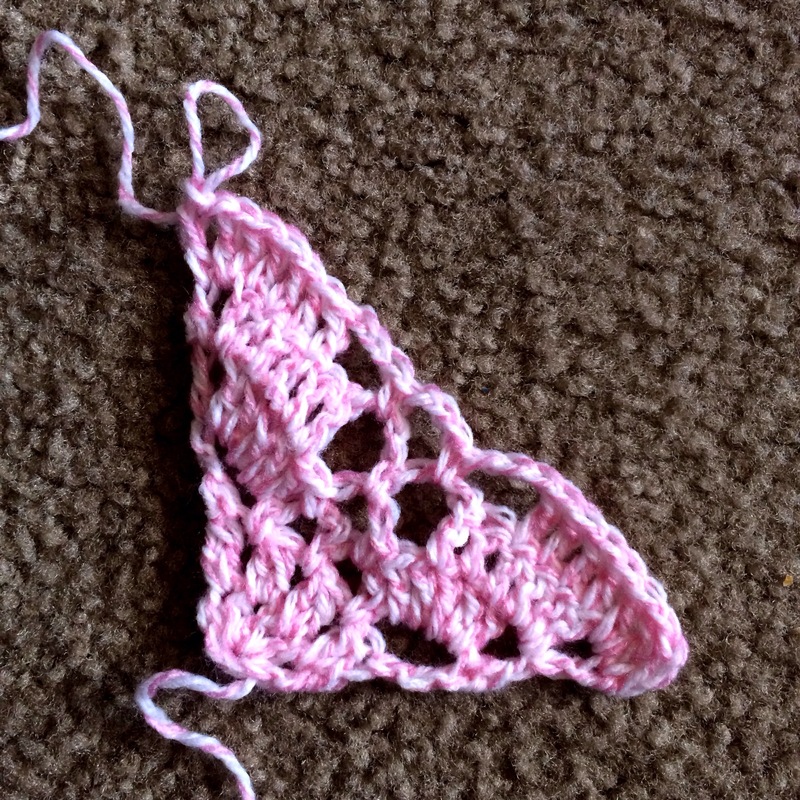 I am pulling up the free diagonal loop from under the horizontally joined loops. This is because when I flip the piece back over, the vertical loops are on top. 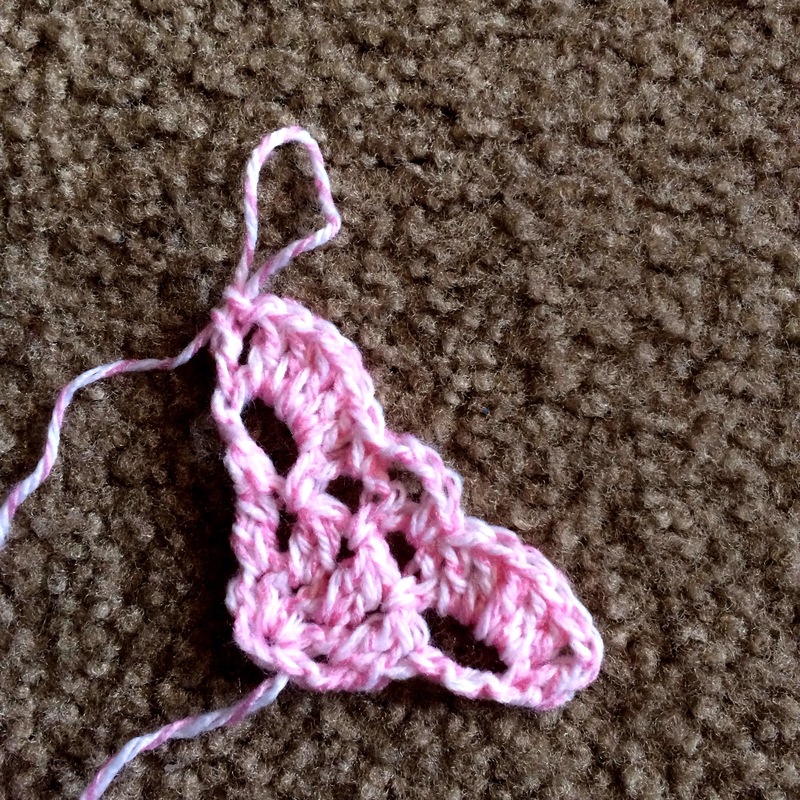 FBJ in this loop as below, chain 2, skip 1 stitch, SC in next stitch to complete corner. 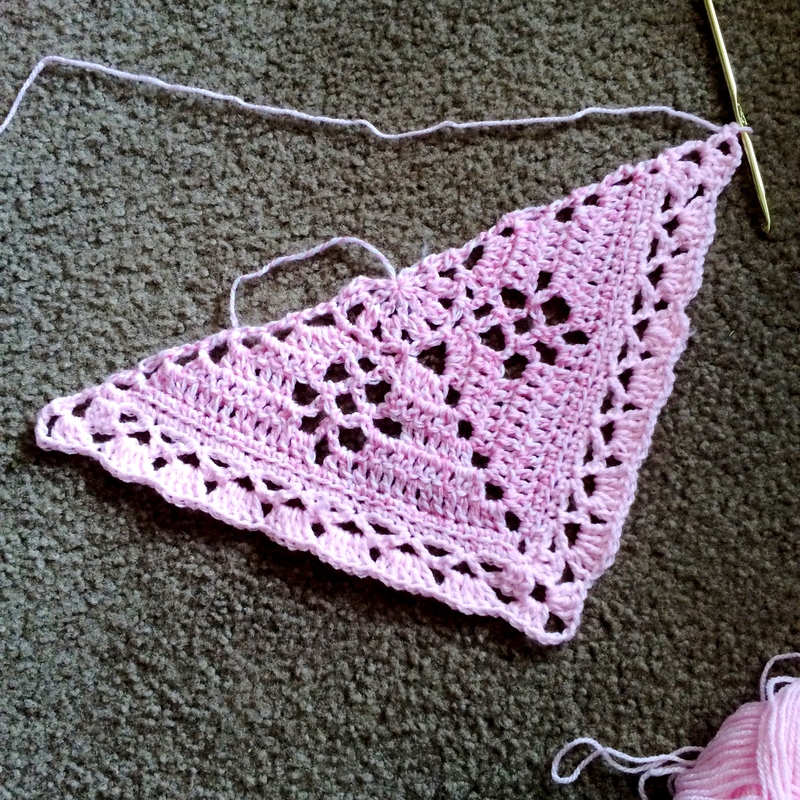 Work side 2 of motif. 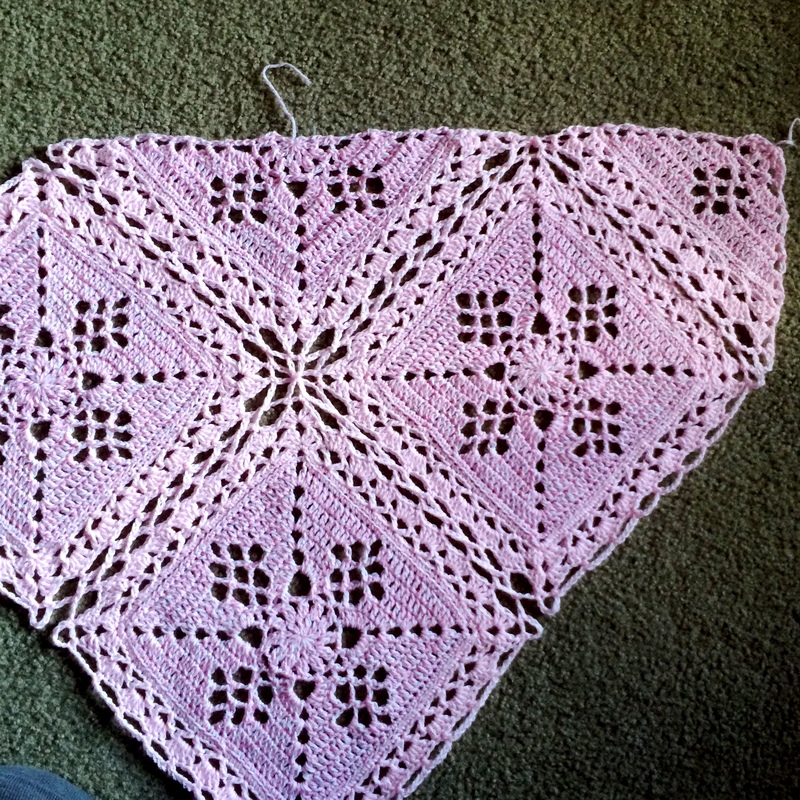 Here is the half-motif all joined in. take note of which corner loops are joined, and which aren’t. Work Row 1: Join yarn in first corner with right side facing. Work 3 SC in same corner, SC through back loop only across, 3SC in final corner. Turn work. Flip the whole piece over as before. Row 2: Work across, making FBJ to connect all the chain-3 loops. When you approach the second corner, SC, chain 2. Now you should be looking at something like the photo below. It’s a little hard to tell in the photo, but what I’ve done is, using my fingers, pull the right side loop through the center loop. In the photo below, you can see it done. 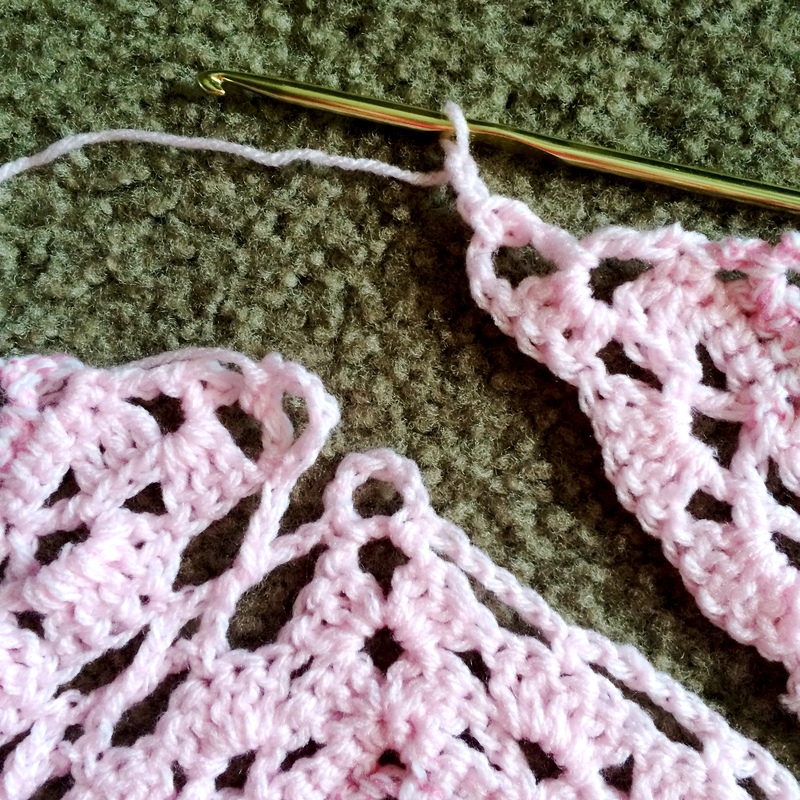 Now, FBJ into that loop you pulled through, chain 2, SC in to final stitch. Corner complete. Now, I have flipped the piece back over and situated the corner join so that it is centered correctly. You can see below that the center loop crosses around the horizontally-joined corners. 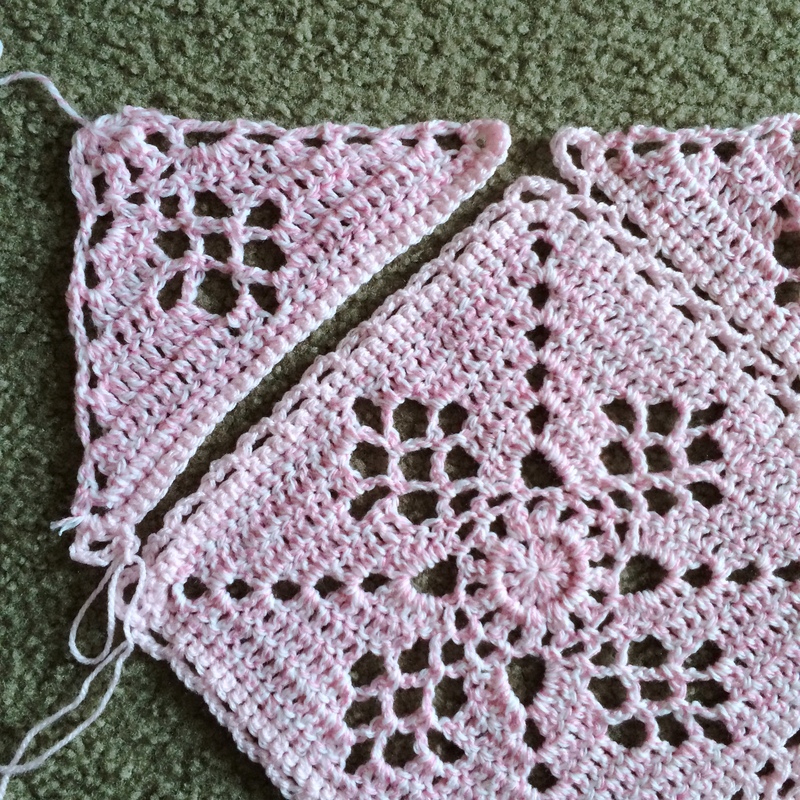 This is how you will join the corners on all remaining half- and quarter-motifs around the perimeter. Once you have all partial motifs joined in, there will be no un-joined corner loops. 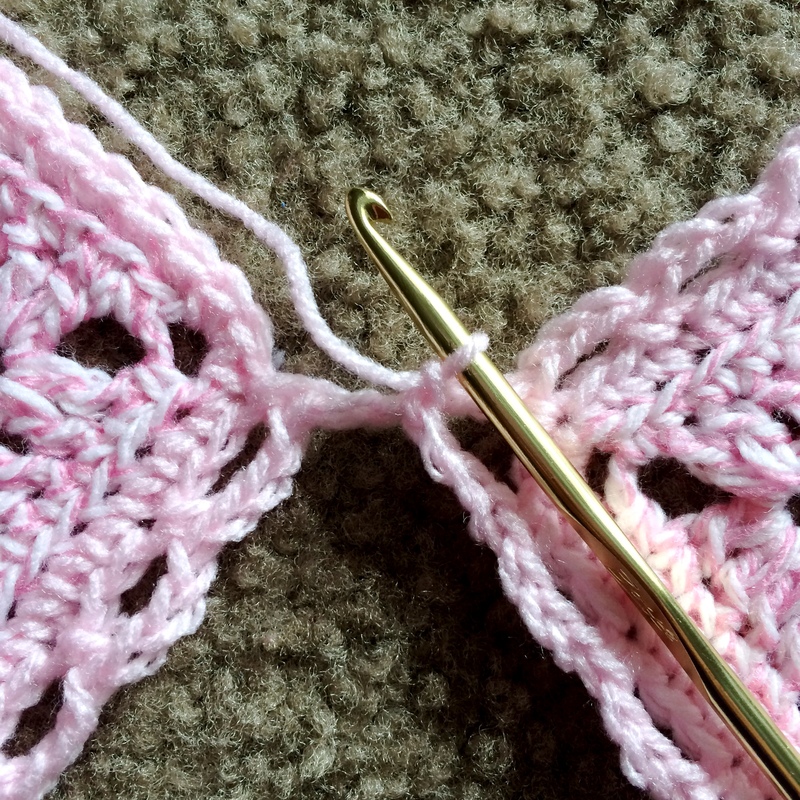 Take great care to make sure your corner loops are joined correctly, with the vertically-join corners lying on top. To read more about the Flat Braid Join, see this tutorial! Update! 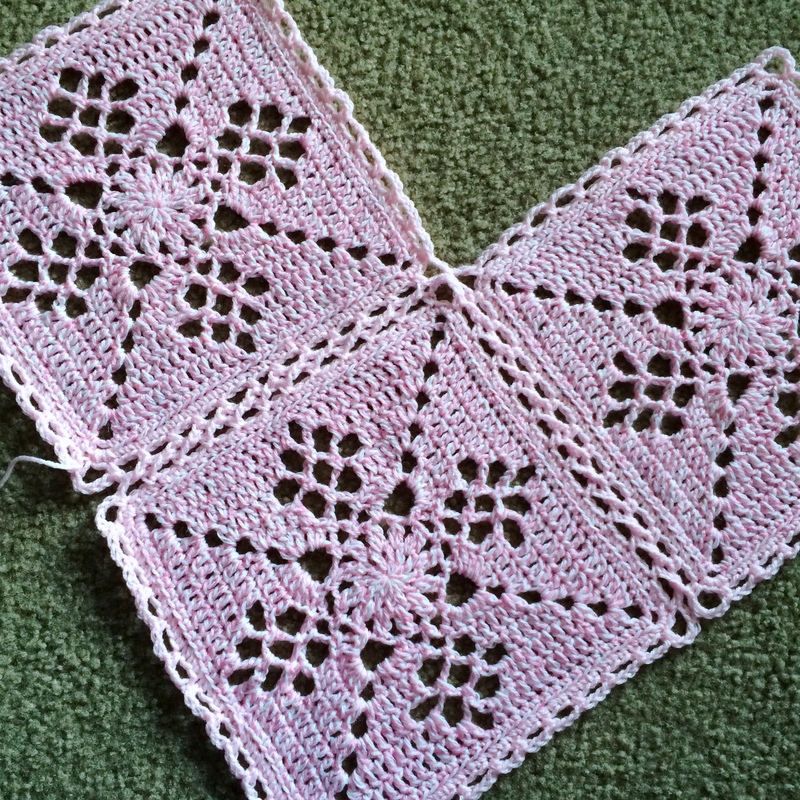 I have changed these patterns to reflect the language of the original Victorian Lattice Square pattern! I have also addressed the issue regarding the trouble with shaping the partial pieces that some folks are having. I did not change my photographs, so the photos still reflect my original instructions. We are working on having the partials translated into chart form, so that should help! 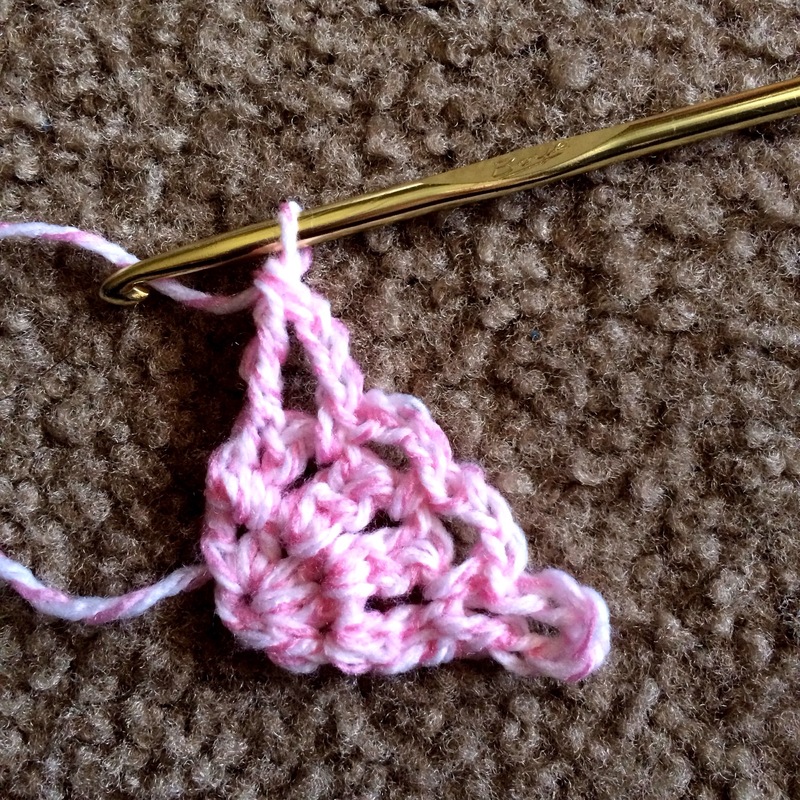 Ch-3, join with slip stitch to make a ring. Row 2: (SC, Ch-1, DC) in first chain space. Ch-2, (DC2TOG in next chain space, Ch-2) 2 times, DC2TOG in final chain space, turn work. Row 3: SC in first DC. Ch-6, SC in first chain space. (Ch-3, SC in next chain space) 2 times, Chain 3, TR in final chain of row below, turn work. Row 4: SC in top of TR, Ch-3, 5 DC in Ch-3 space, SC in next chain space, Ch-4, SC in next chain space, 5 DC, Ch-2, DC in second chain from beg SC of row below, turn work. Row 5: SC in top of first DC, Ch-3, 2 DC in chain space, DC in next 4 stitches, skip 1 DC, Ch-4, SC in chain space, Ch-4, skip 1 DC, DC in next 4 stitches, 2 DC in final chain space, Ch-2, DC in second chain from beg SC of row below, turn work. Row 6: SC in top of first DC, Ch-3, 2 DC in chain space, DC in next 4 stitches, skip 2 DC, (Ch-4, SC in next chain space) 2 times, Ch-4, skip 2 DC, DC in next 4 stitches, 2 DC in final chain space, Ch-2, DC in second chain from Beg SC of row below, turn work. Row 7: SC in first DC, Ch-2, 2 DC in chain space, DC in next 6 stitches, 2 DC in next chain space, Ch-4, SC in next chain space, Ch-4, 2 DC in next chain space, DC in next 6 stitches, 2 DC in final chain space, Ch-2, DC in second chain above beg SC on row below, turn work. Row 8: SC in first DC, Ch-3, 2 DC in first chain space, DC in next 10 stitches, 2 DC in next chain space, Ch-1, 2 DC in next chain space, DC in next 10 stitches, 2 DC in final chain space, Ch-2, DC in second chain before beg SC in row below, turn work. 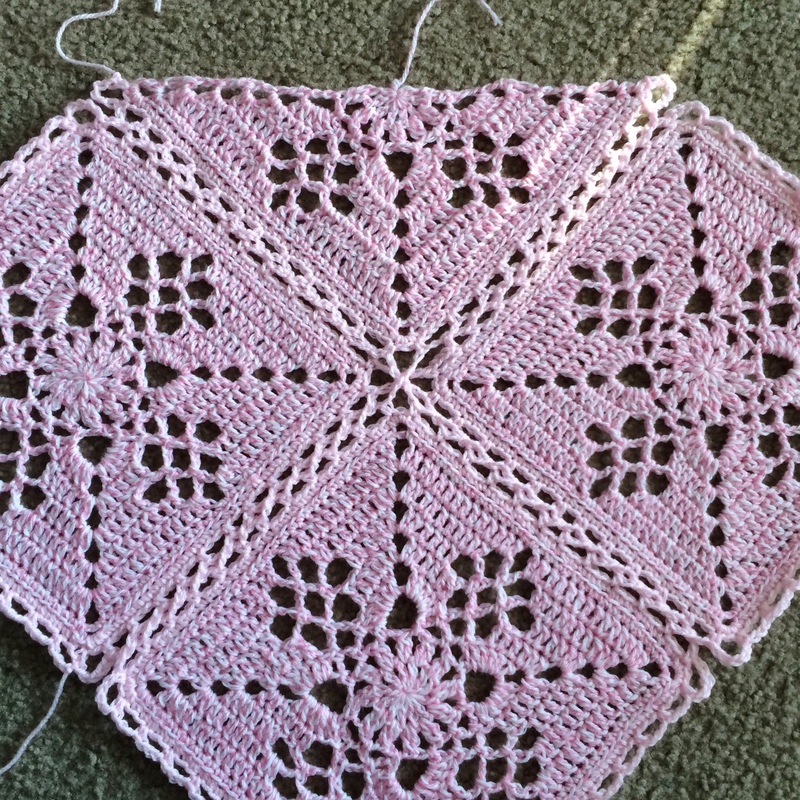 Cut yarn after Row 8. Re-join yarn with Row 8 facing up. 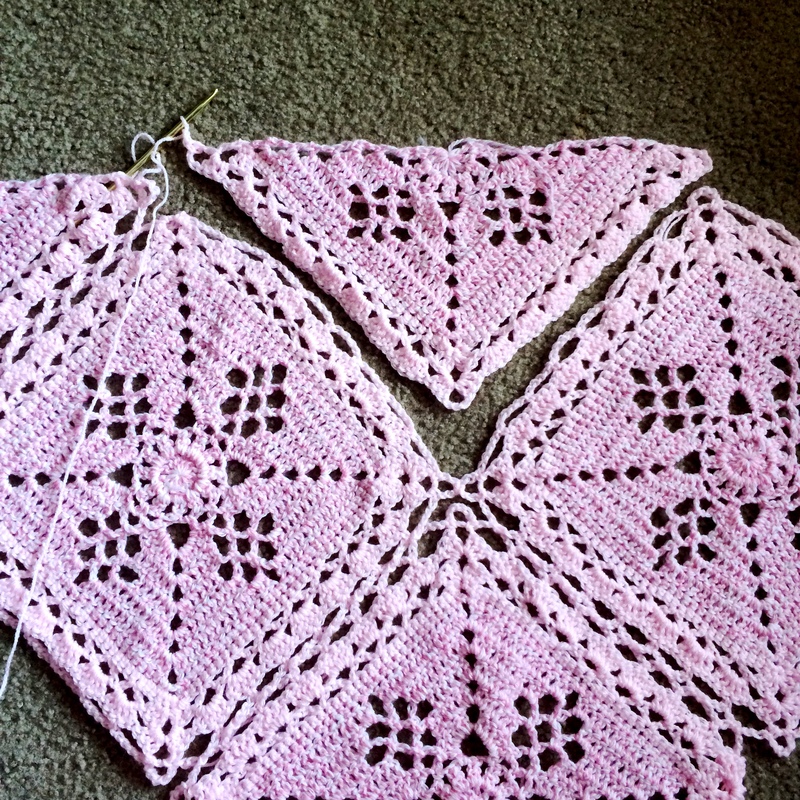 Work Row 9 and finish off. Both Row 8 and 9 will be on the right side, for a nicer look when joining. Round ’em Up: Part 2! Just wanted to drop in and say hi and see how things are going. 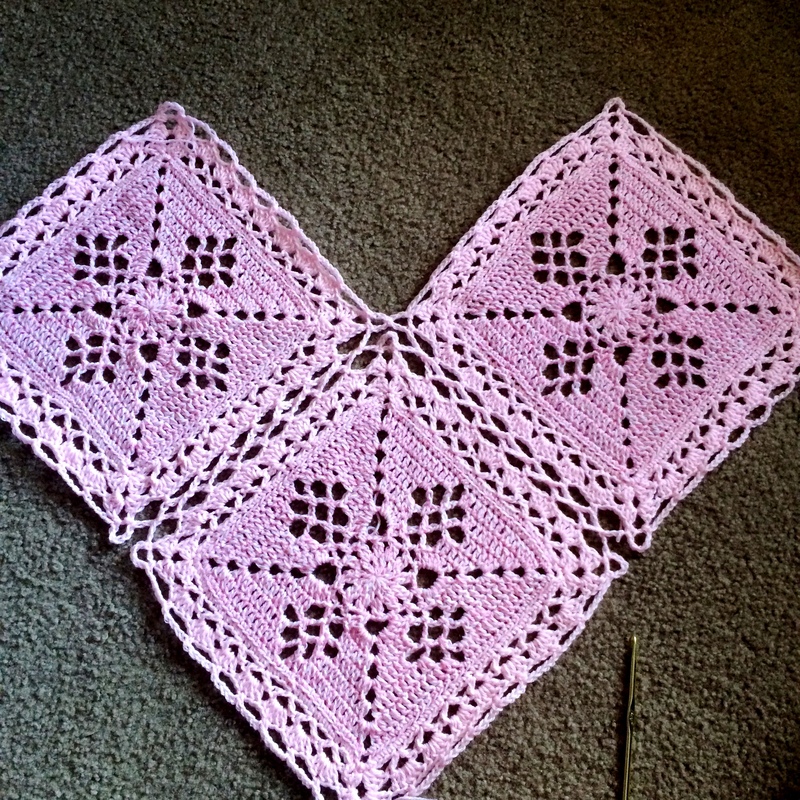 I am completely blown away with all the love you are giving the Victorian Lattice Square (aka MysterySquare2014)! Bet this one is super soft! 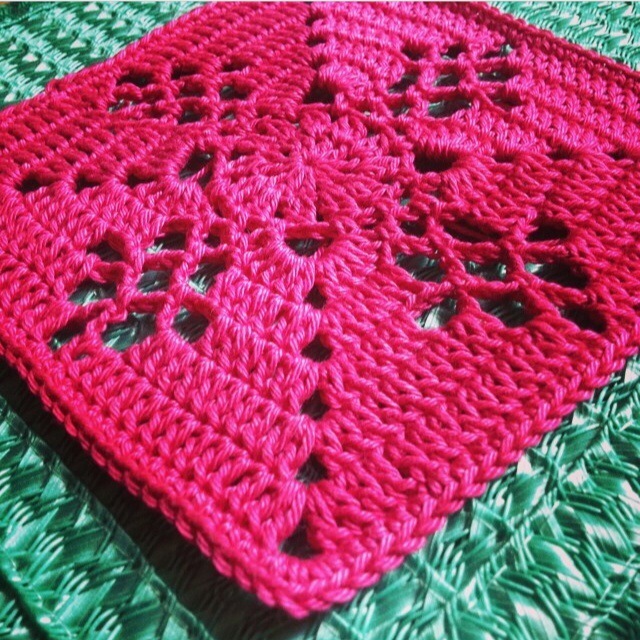 @virkatmedtiina is using alpaca for her squares! 5 down, 8 to go! 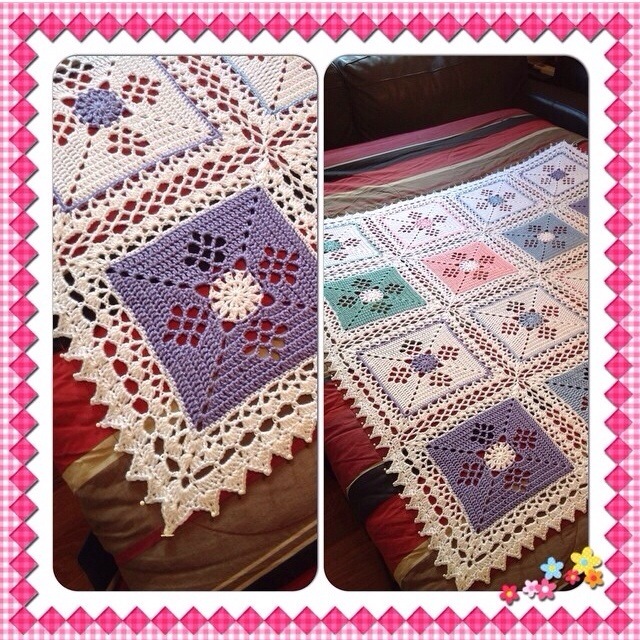 @monicacrochets squares are beautiful! 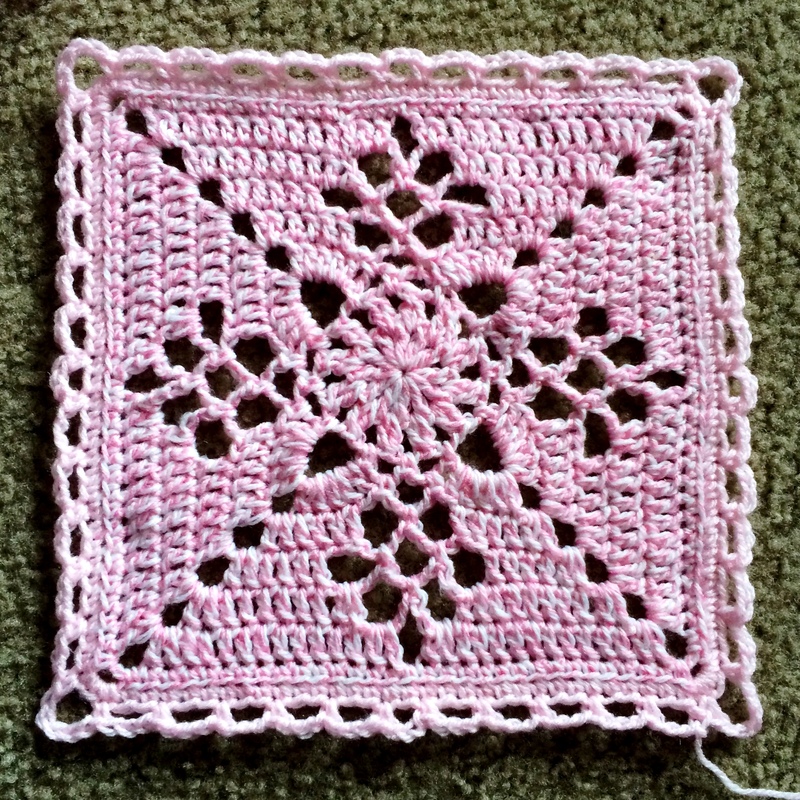 Can’t wait to see more of your Victorian Lattice squares!! 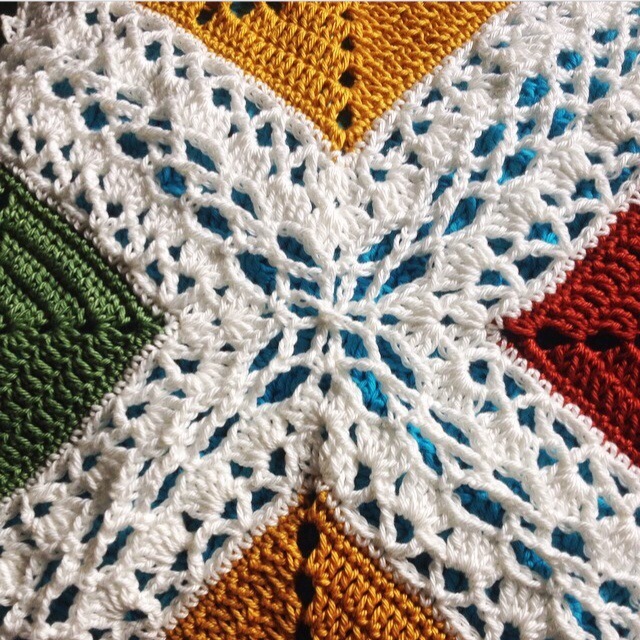 Don’t forget to tag your photos on Instagram with #MysterySquare2014 and #VictorianLatticeSquare for a chance to be featured here on Scrappy Blanket Love! 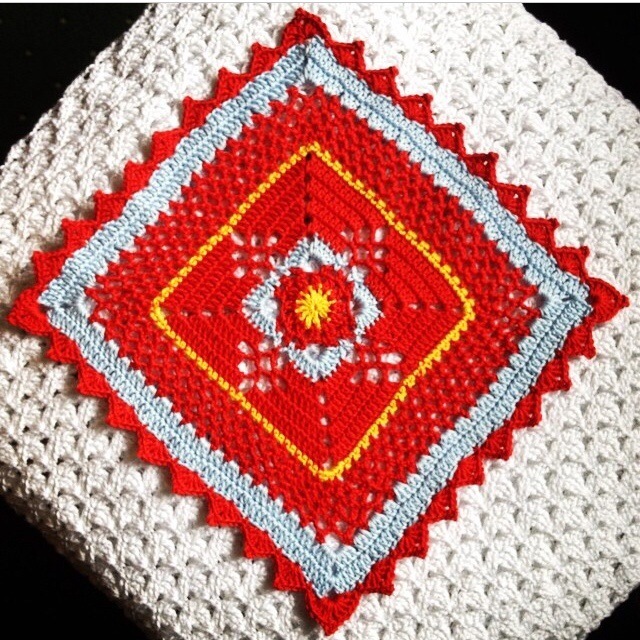 bvcrochet – check out the perfect solid granny square pairing! sherlock1372 – blue check is a bold and lush showcase for this design! 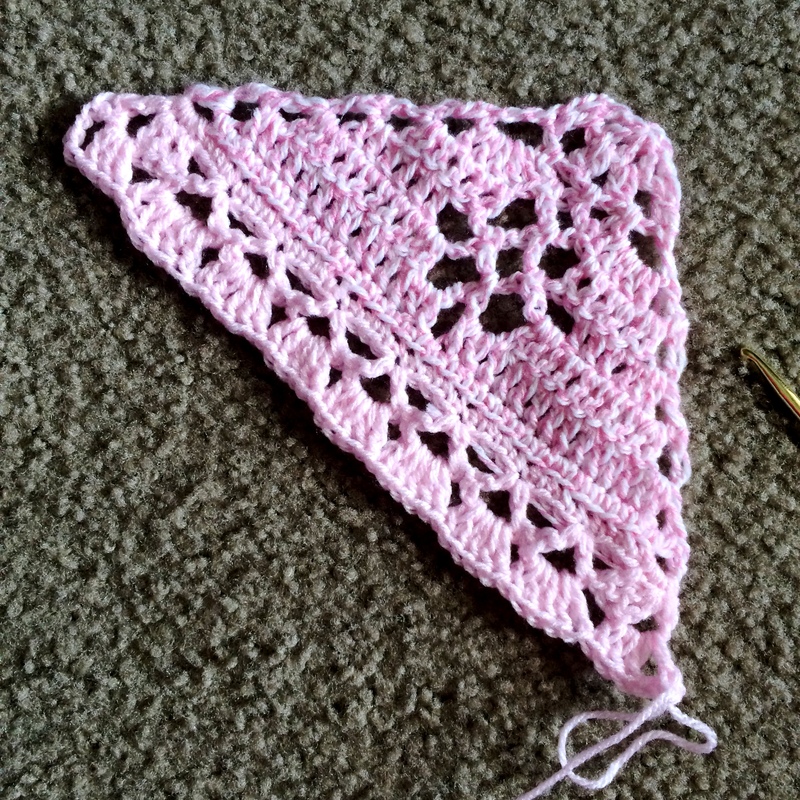 Step 3: To be featured: Share your progress - Instagram tag #scrappycal, or comment here, or email scrappyblanket@ gmail.com - we'll find you! 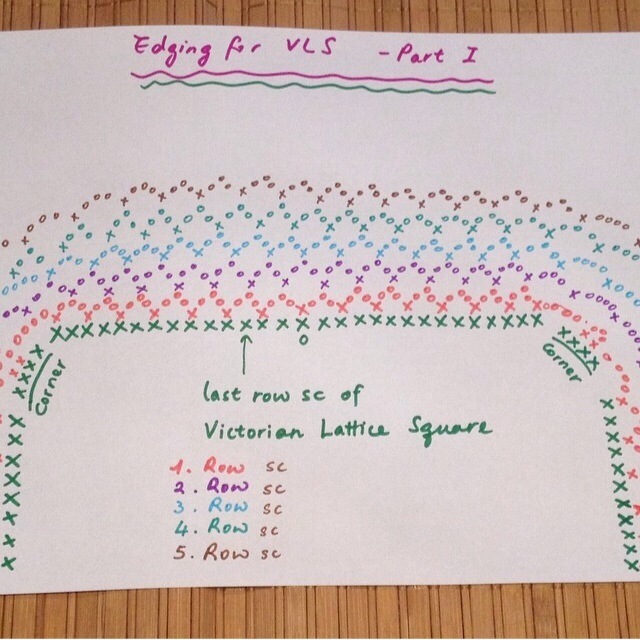 Gorgeous VLS – All joined up!